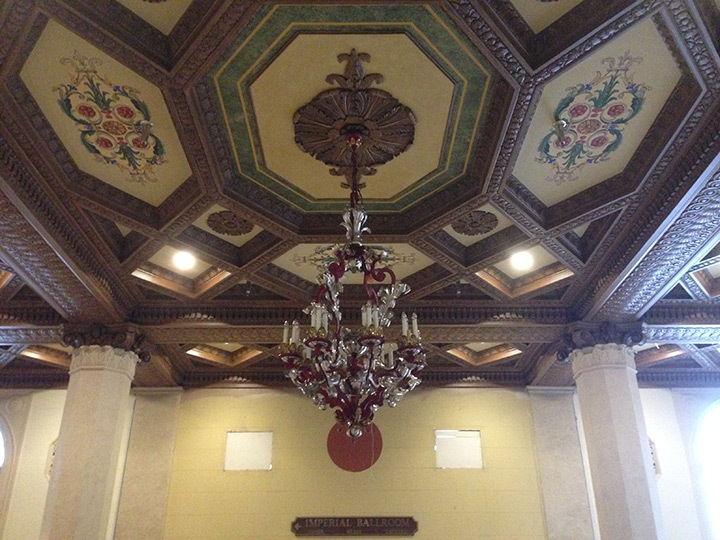 The historic Hotel Syracuse, located in Syracuse, New York, was designed by renowned hotel designer William Stone Post of George B. 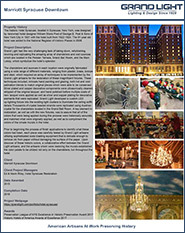 Post & Sons of New York City in 1921 with the hotel built from 1922-1924. 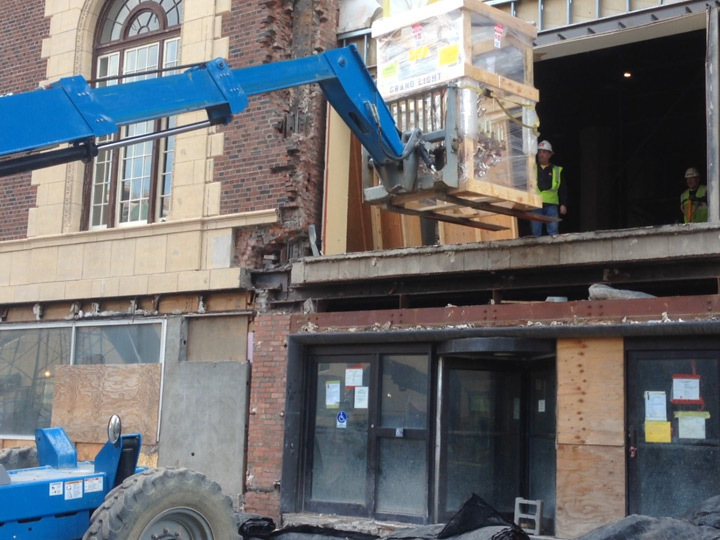 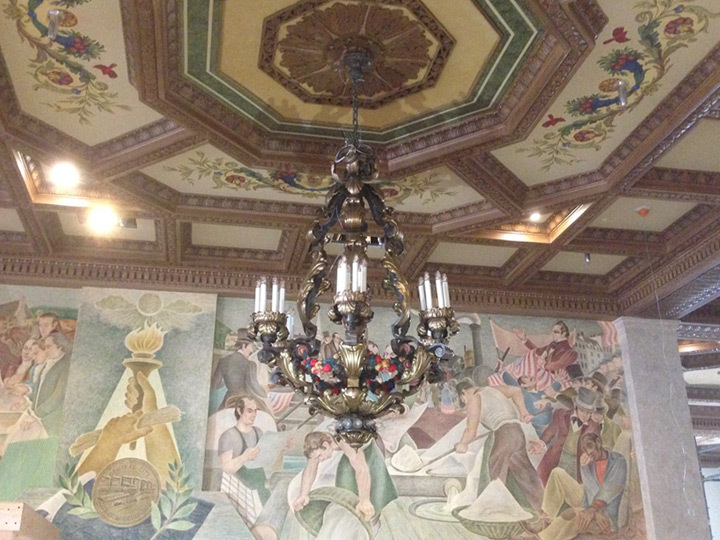 The 91-year old hotel was added to the National Register of Historic Places in 2008. 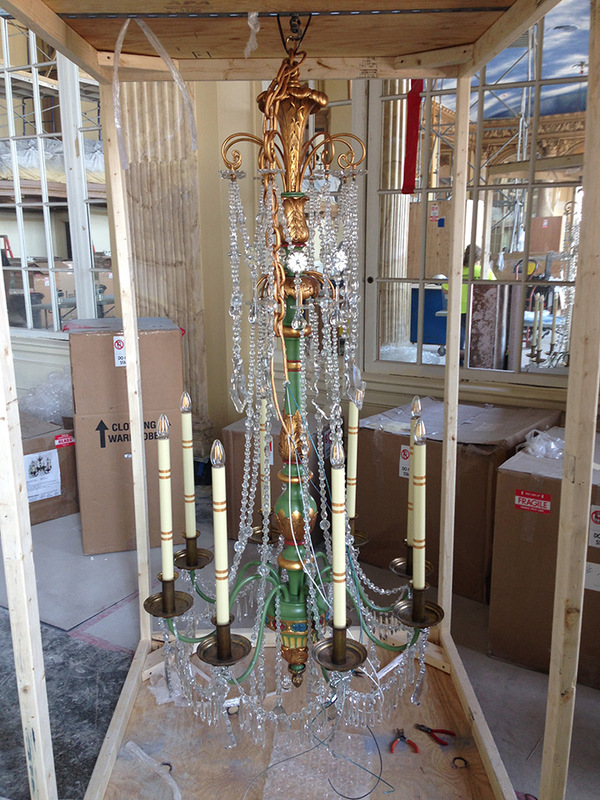 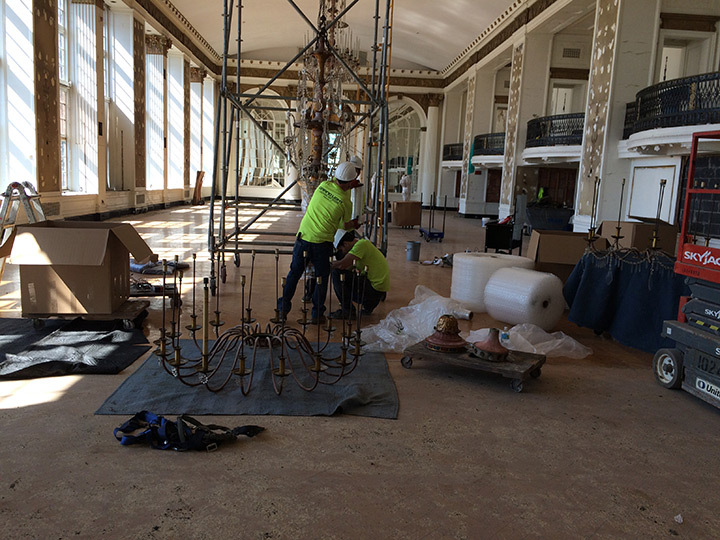 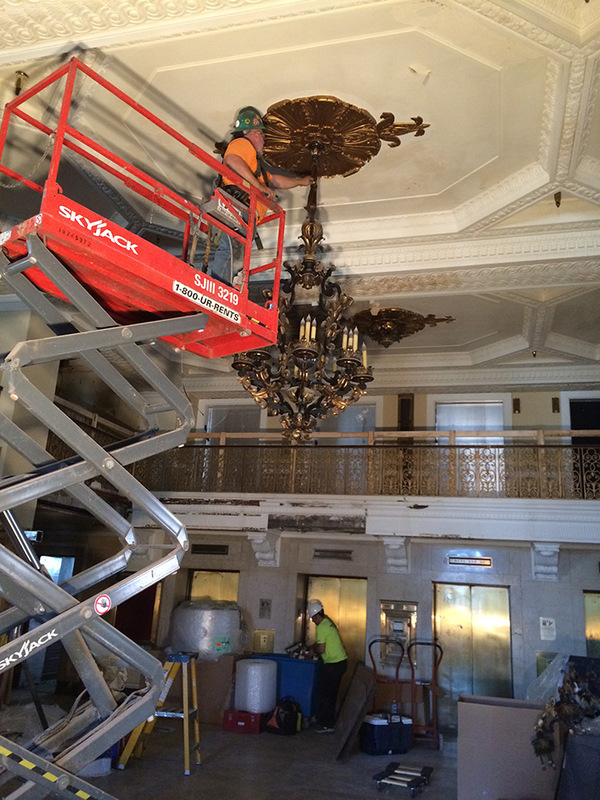 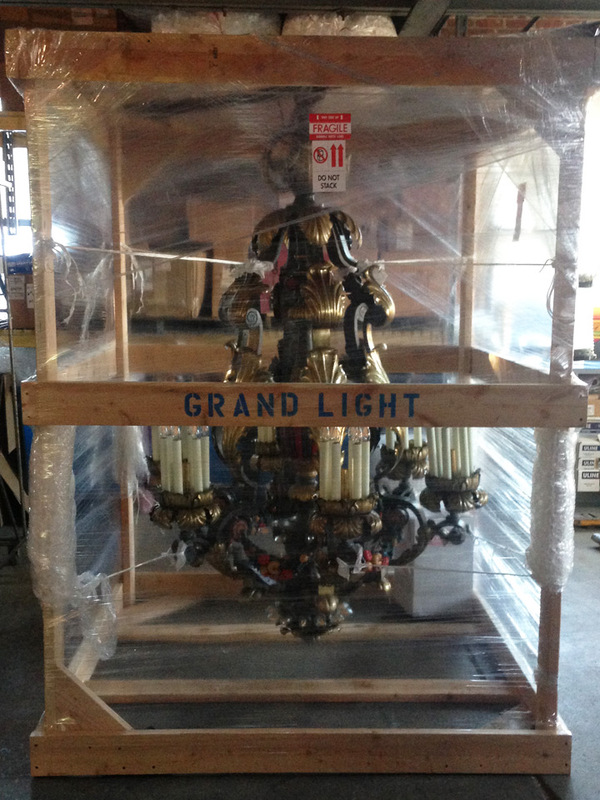 Grand Light had the very challenging task of taking down, refurbishing, rewiring and replicating the amazing array of chandeliers, ceiling lights, and wall sconces which are located in the Persian Terrace, Grand Ball Room, and the Main Lobby, which symbolize the hotel’s splendor. 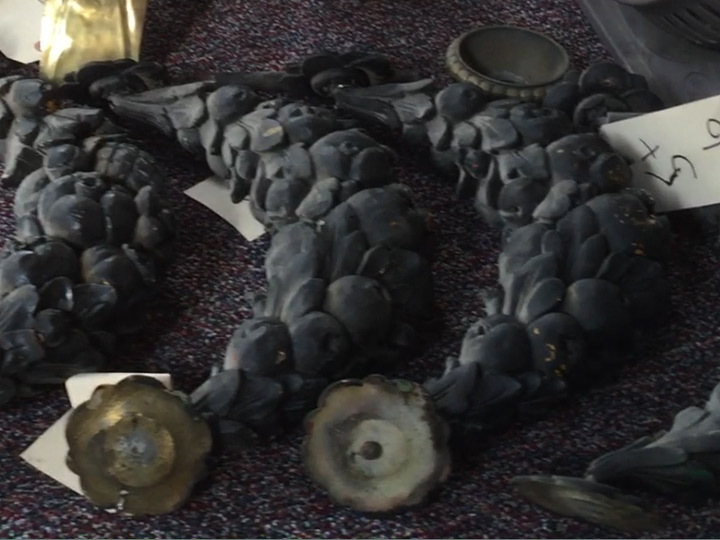 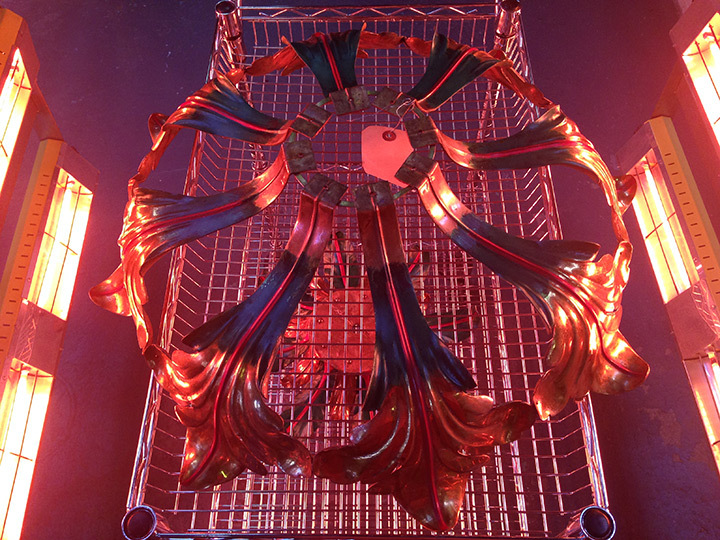 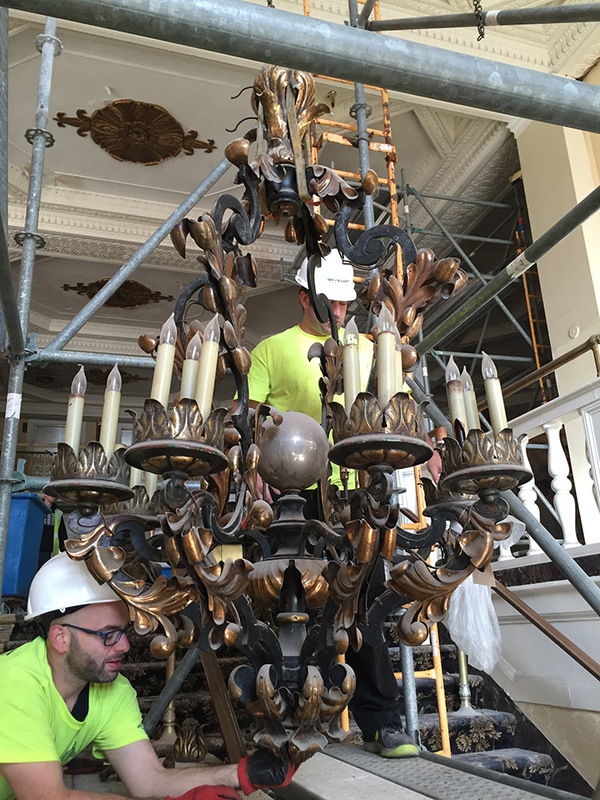 The chandeliers and sconces in each location were originally fabricated using a wide range of different materials, ranging from plaster, brass, bronze and steel, which required an array of techniques to be implemented by the Grand Light artisans for the restoration of these magnificent fixtures. 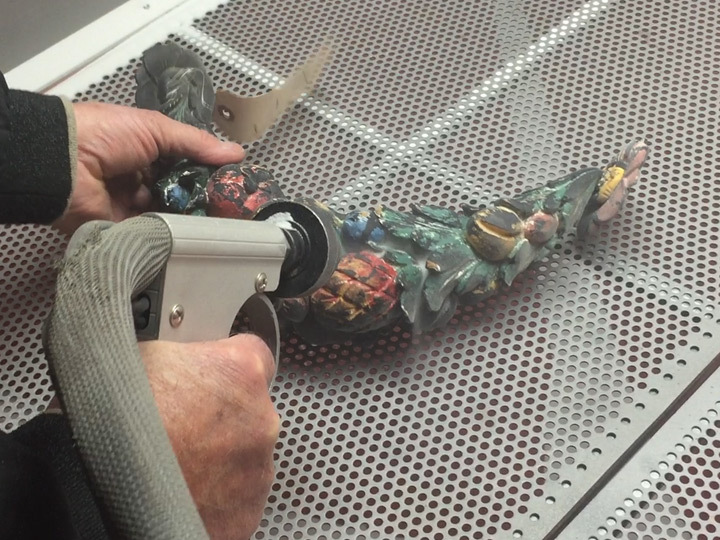 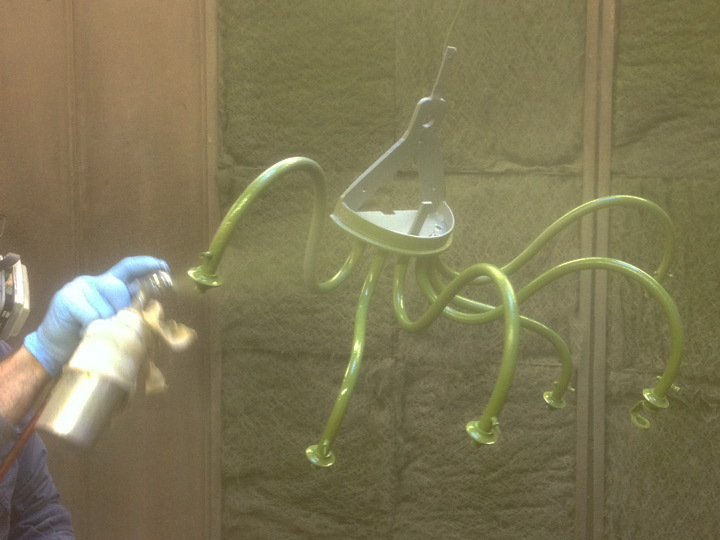 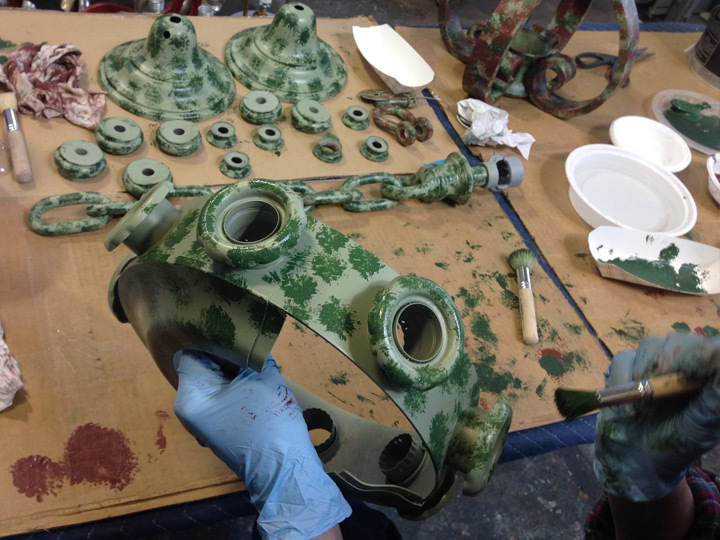 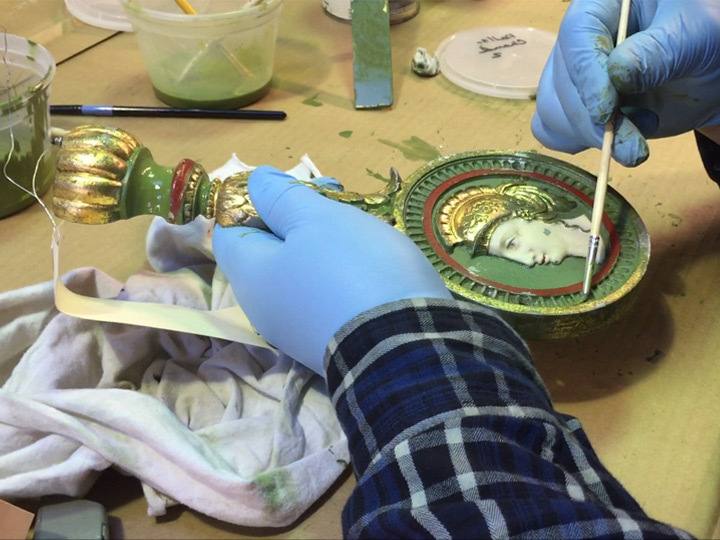 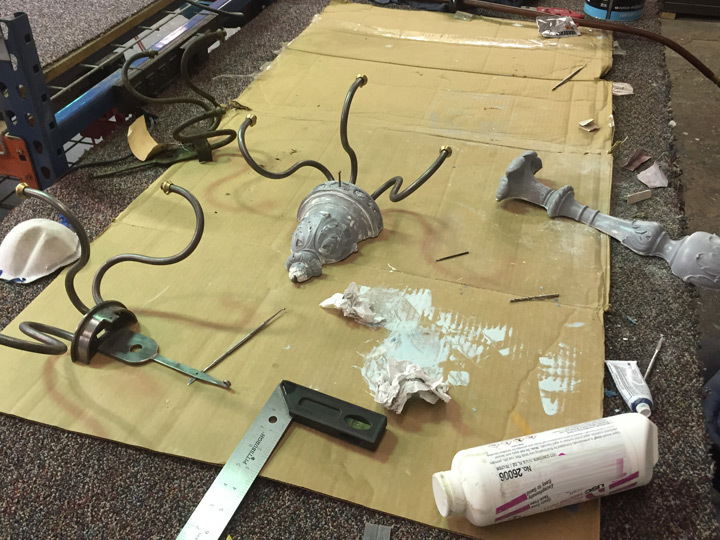 These techniques included, intricate hand painting and glazing, both hot and cold patination blends to match original pieces which were able to be conserved. 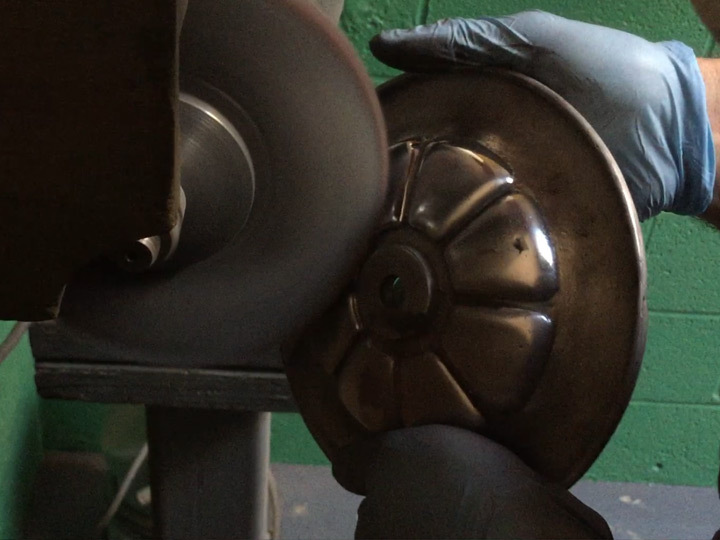 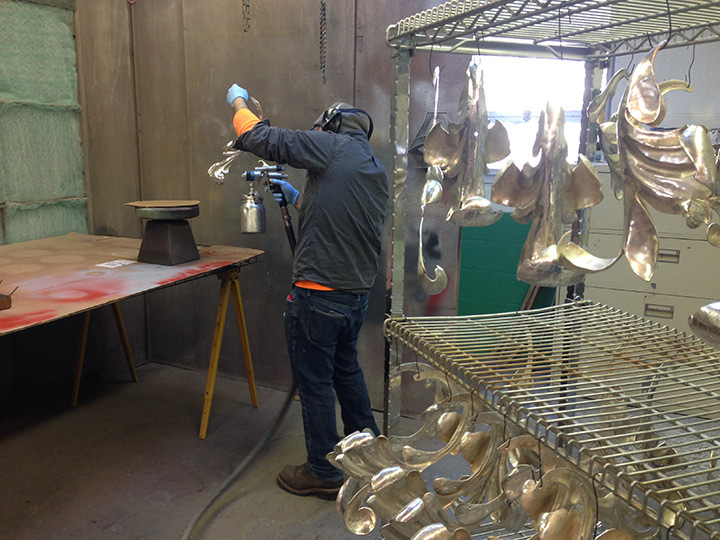 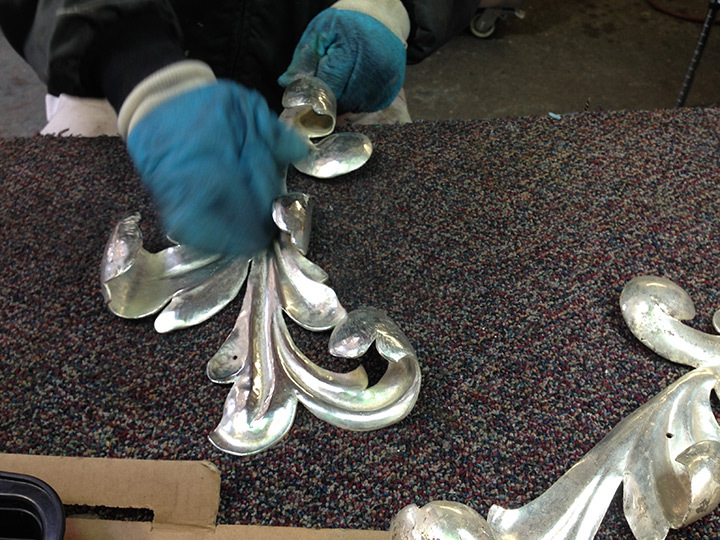 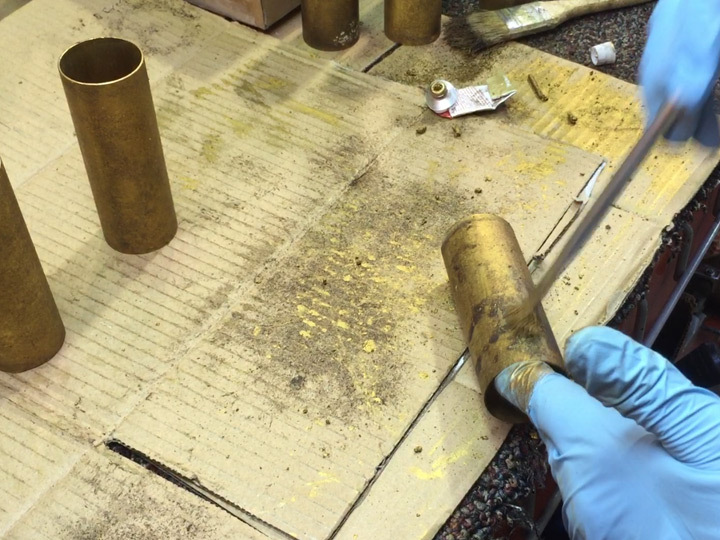 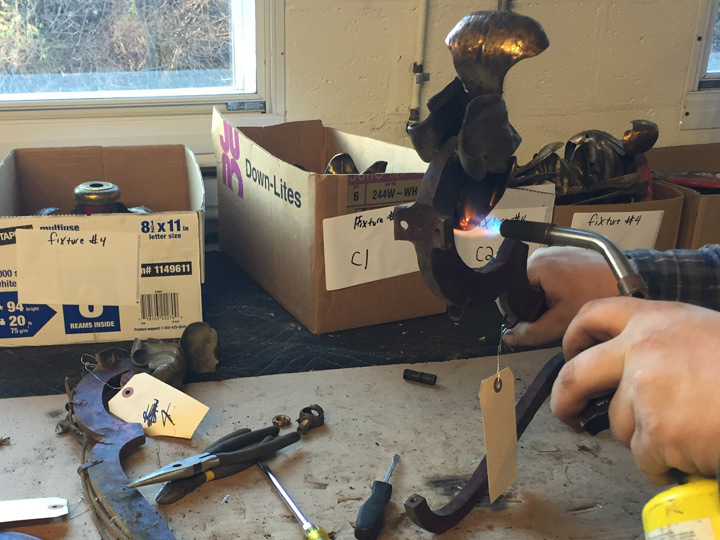 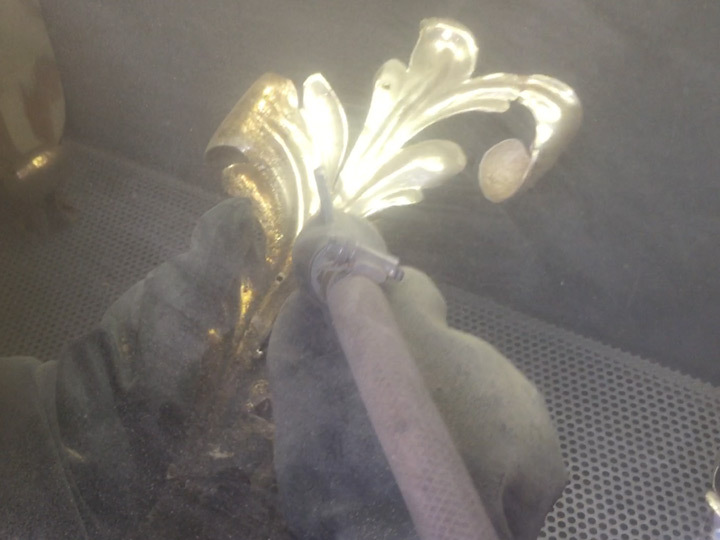 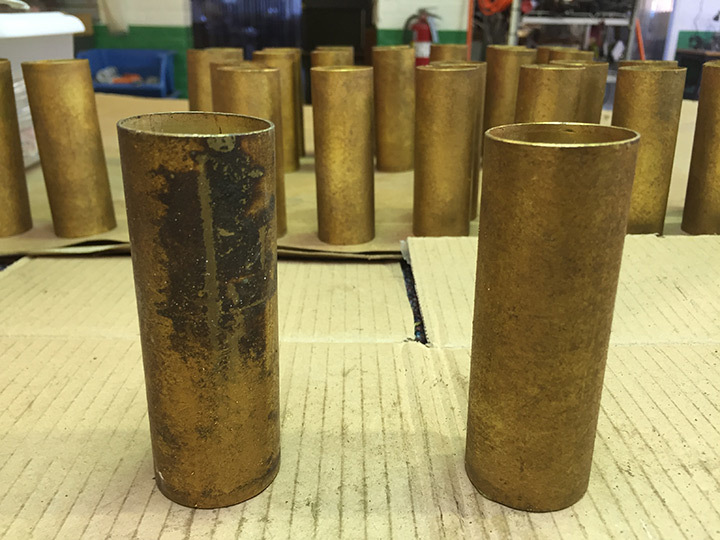 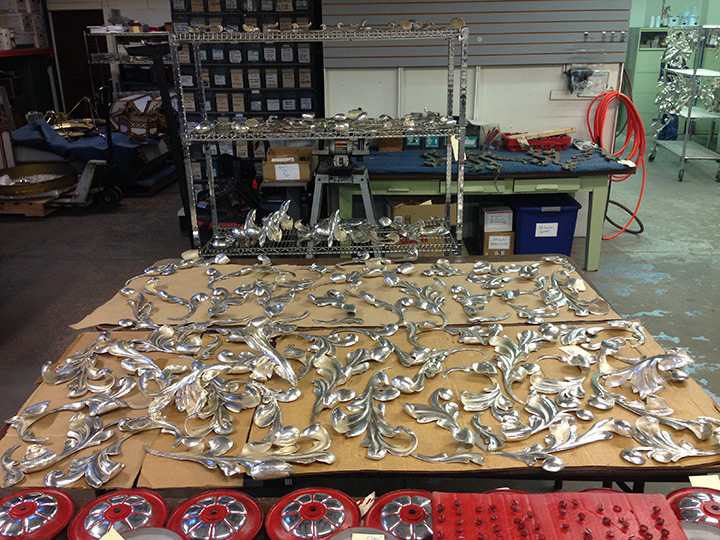 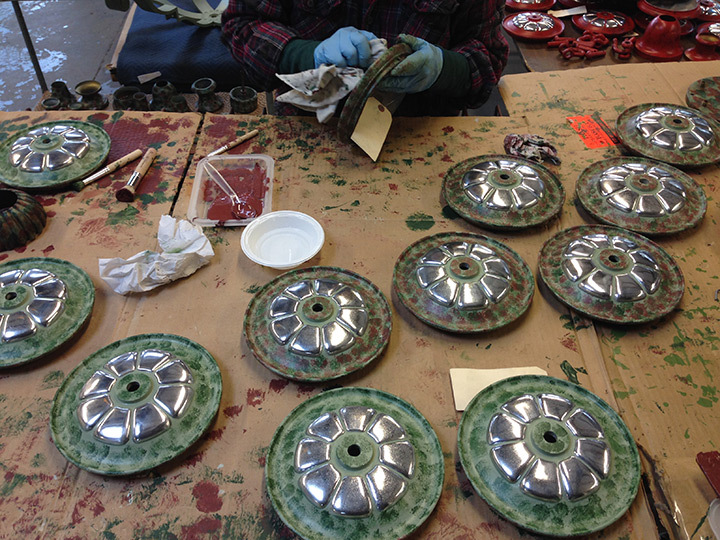 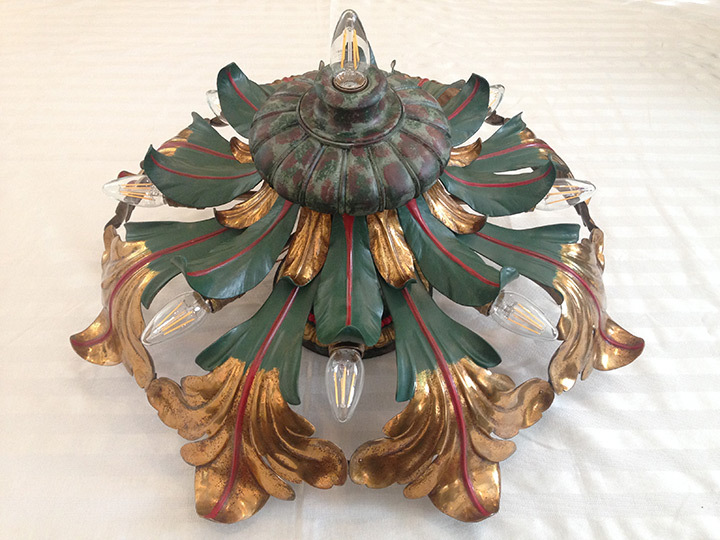 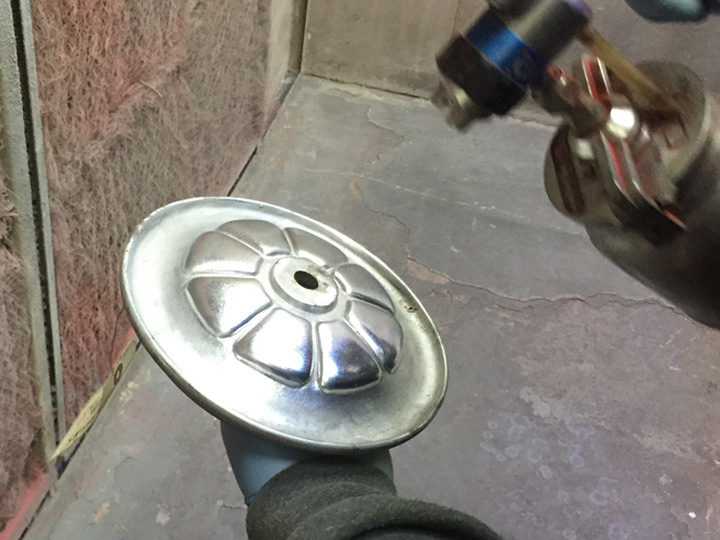 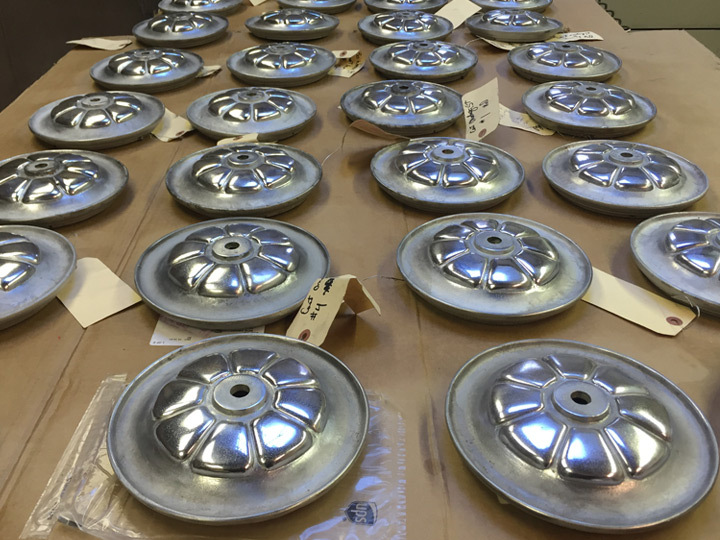 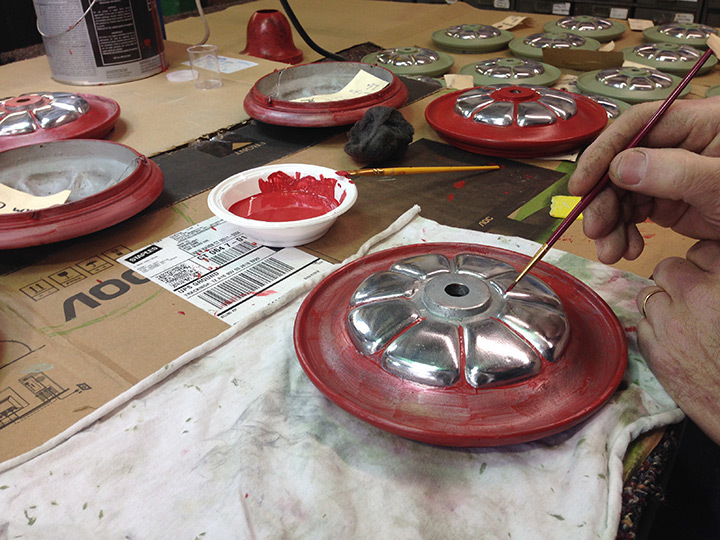 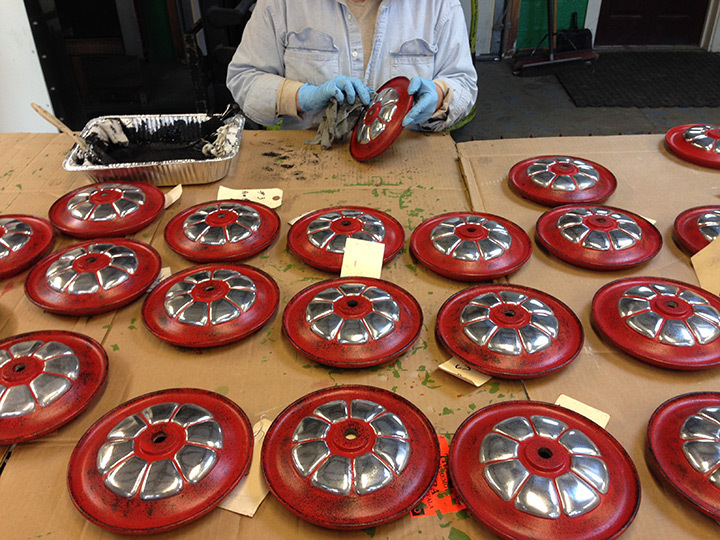 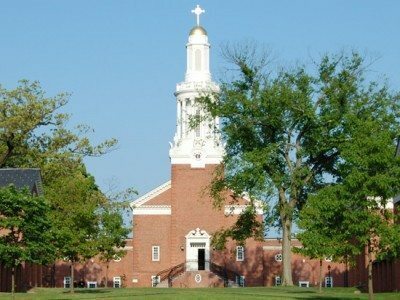 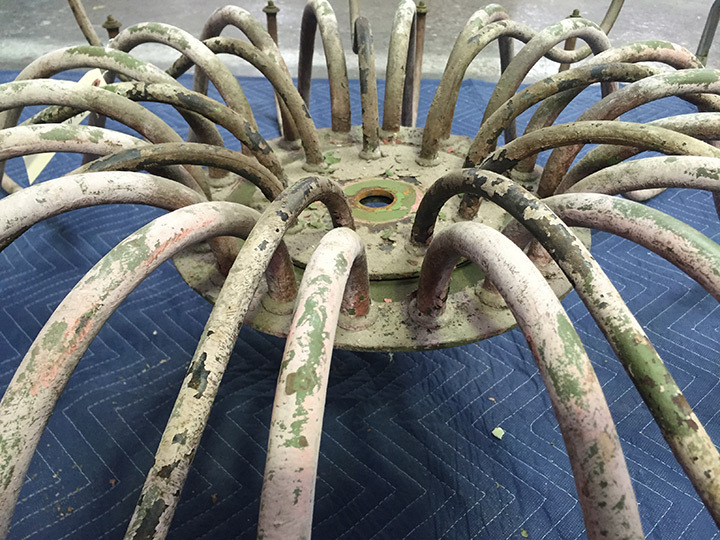 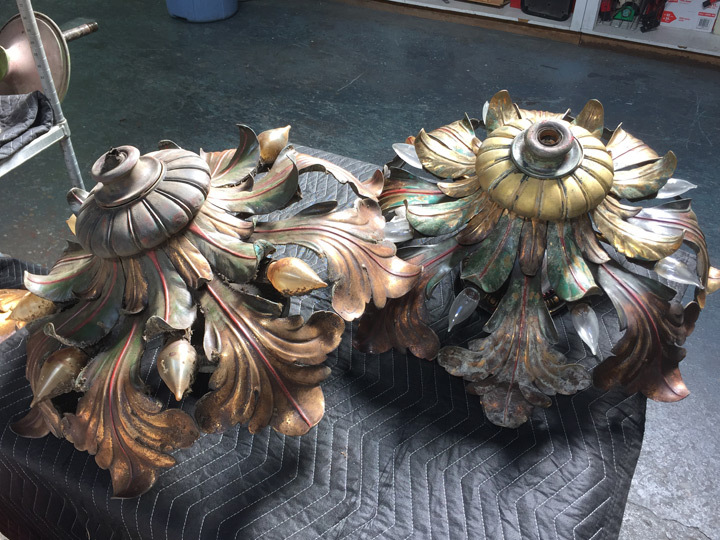 Silver plated and copper decorative components were ultrasonically cleaned, stripped of the original lacquer, and hand polished before multiple coats of new lacquer were applied as well as silver and copper plating for decorative elements that were replicated. 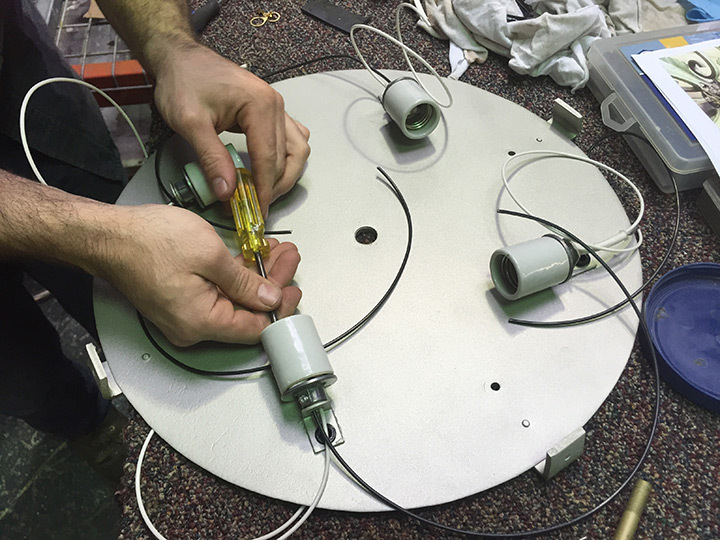 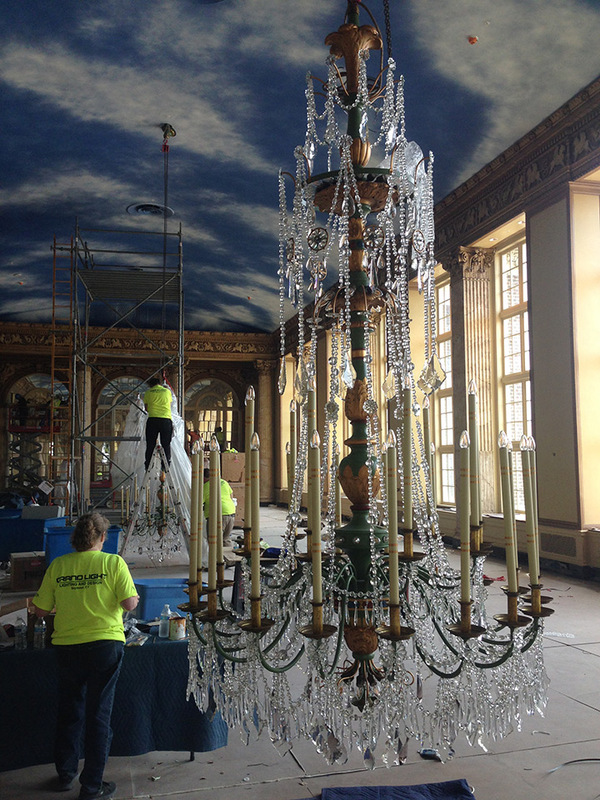 Grand Light developed a custom LED up-lighting fixture into the existing light clusters to illuminate the ceiling soffit details Thousands of crystal beaded strands were replicated using Austrian crystal for the chandeliers located in the Grand Ball Room. 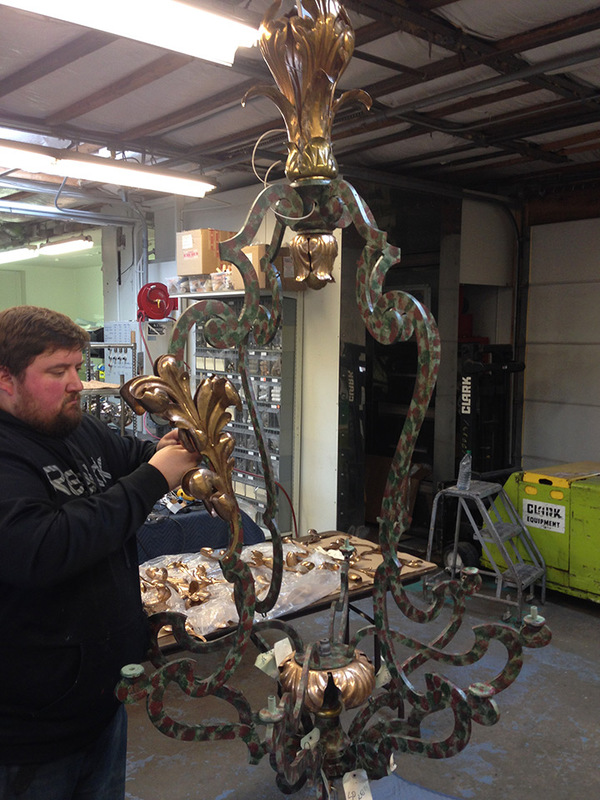 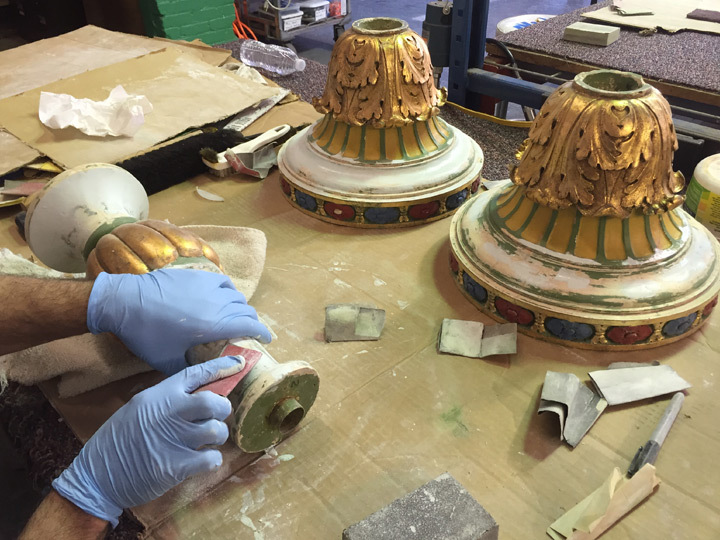 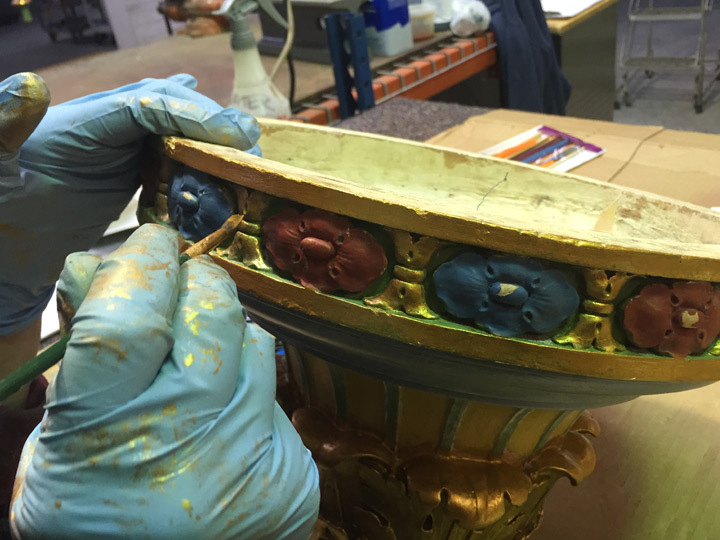 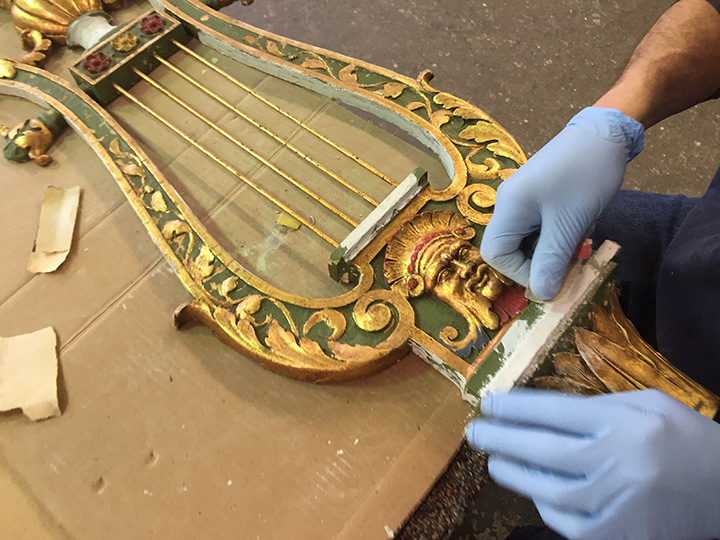 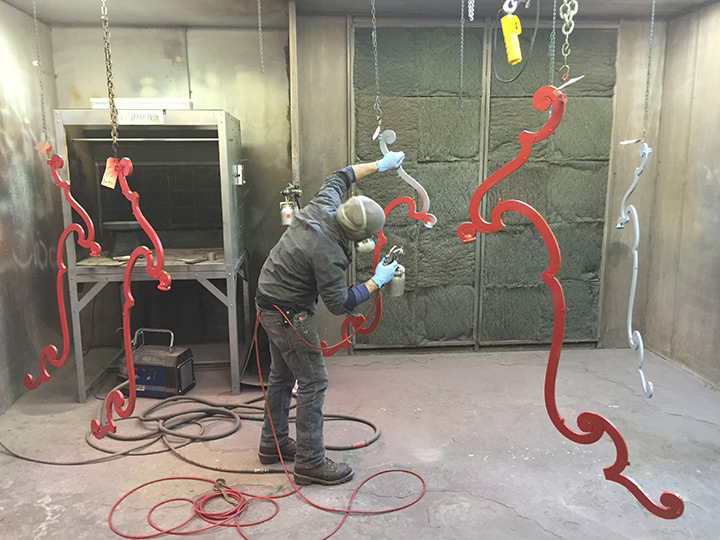 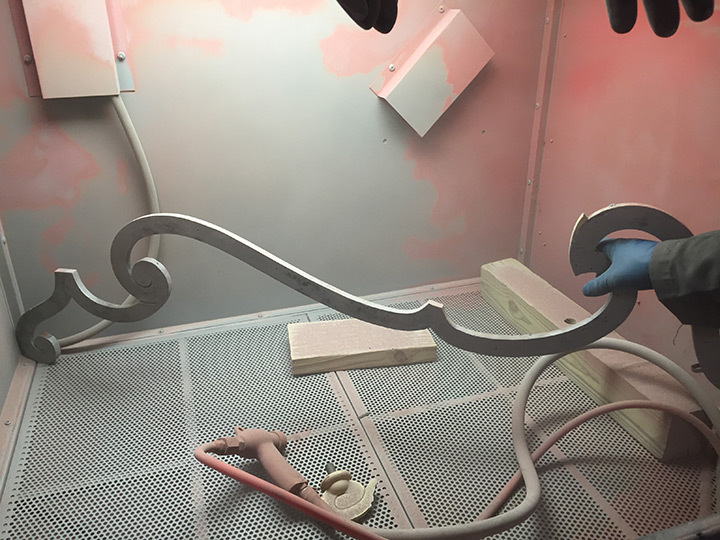 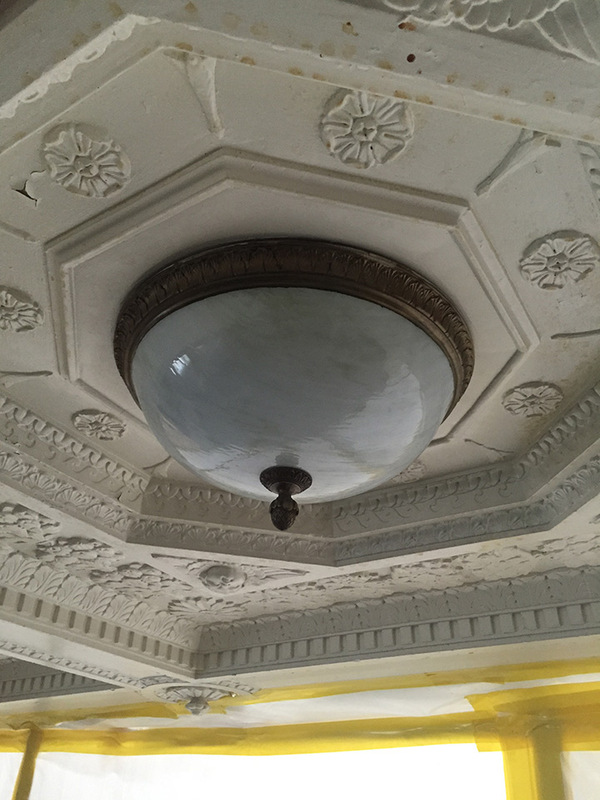 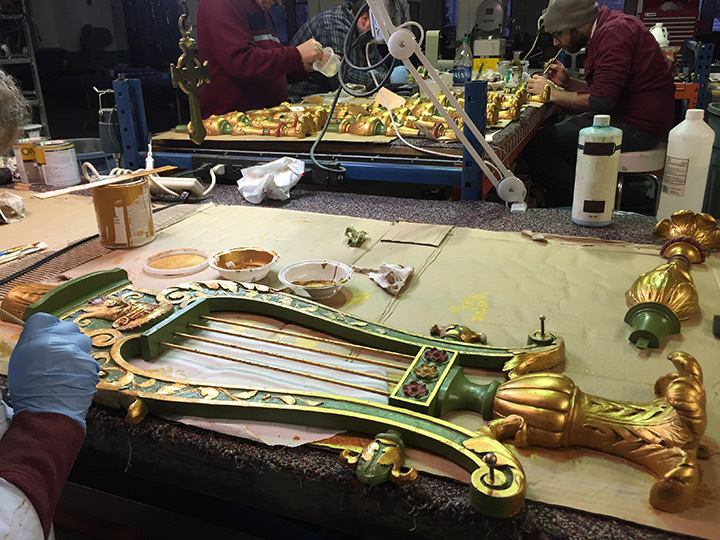 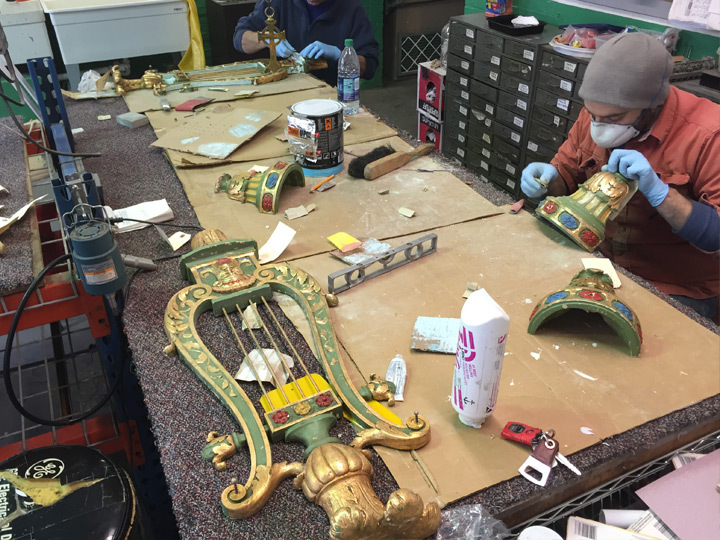 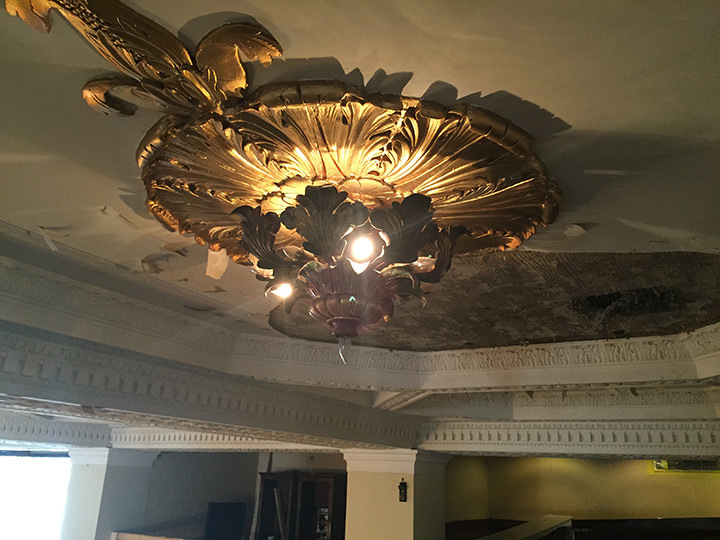 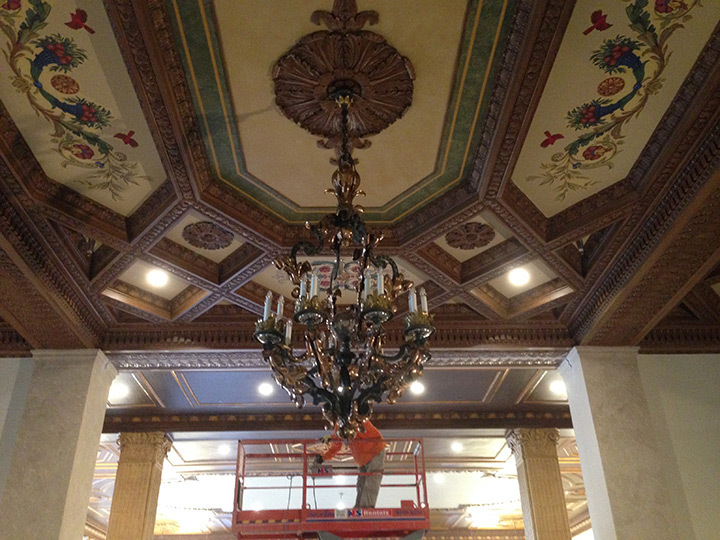 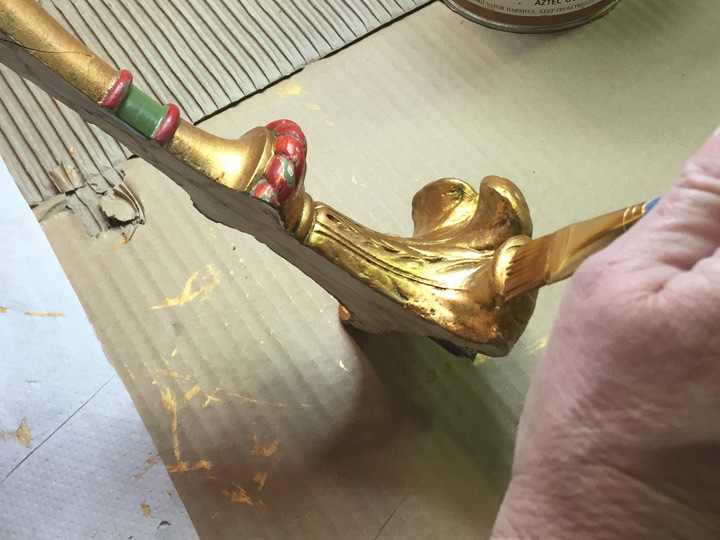 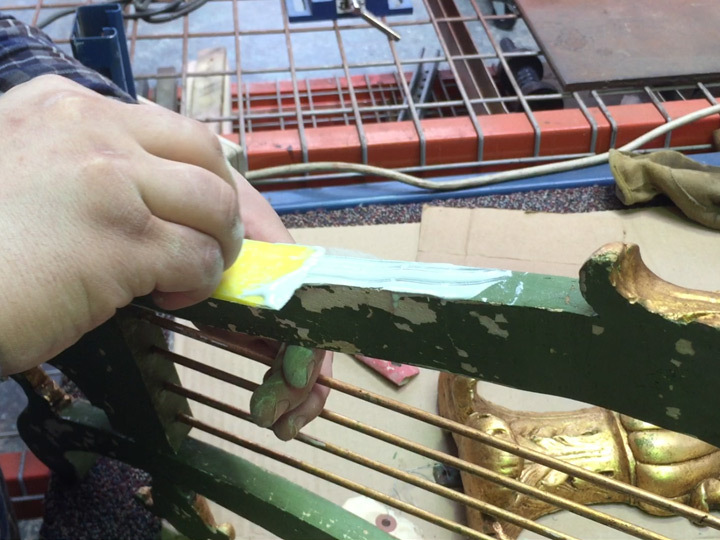 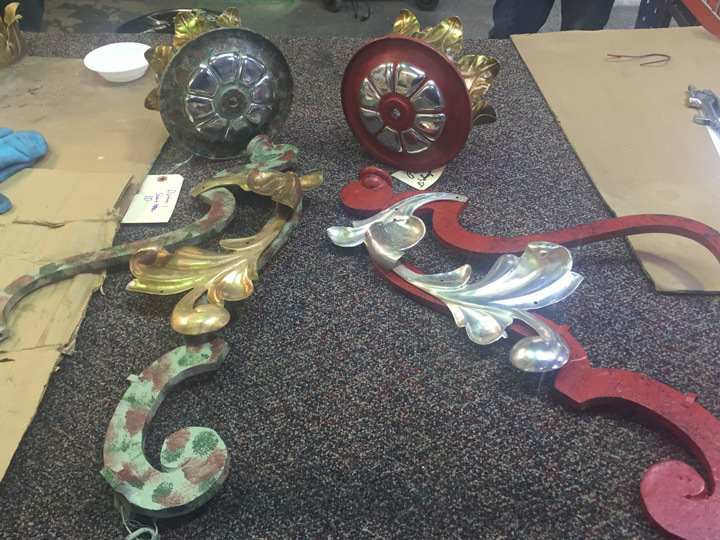 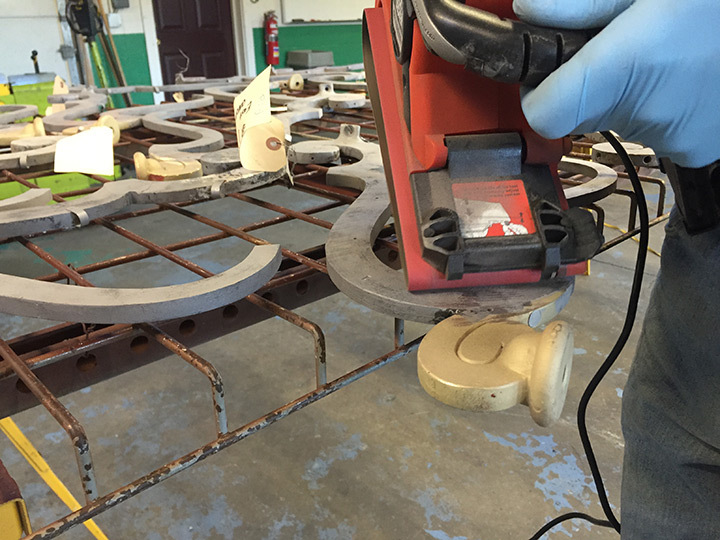 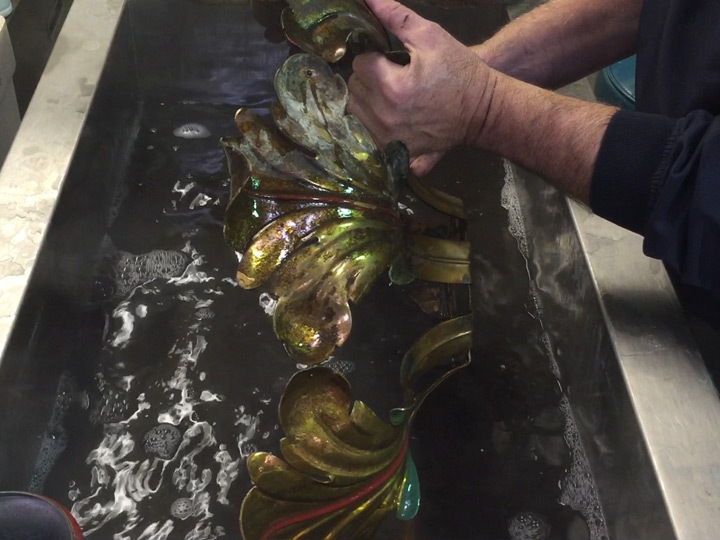 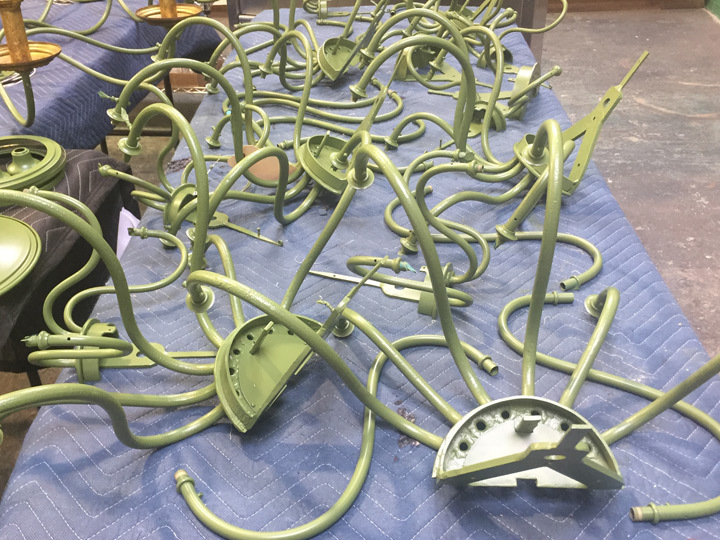 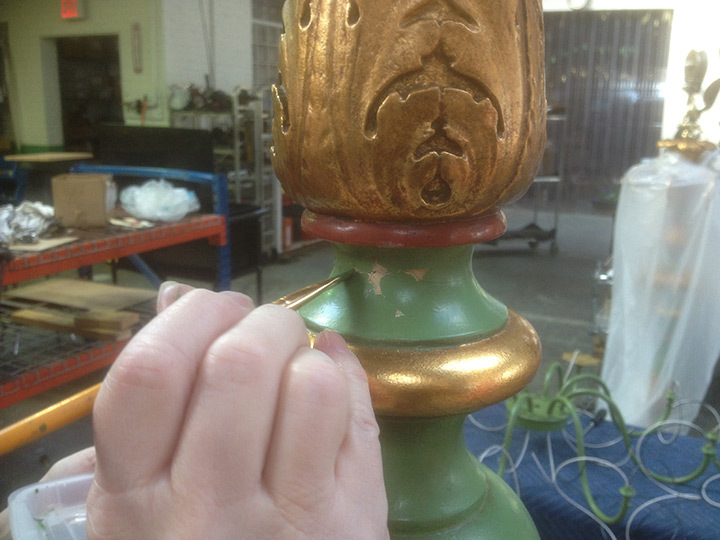 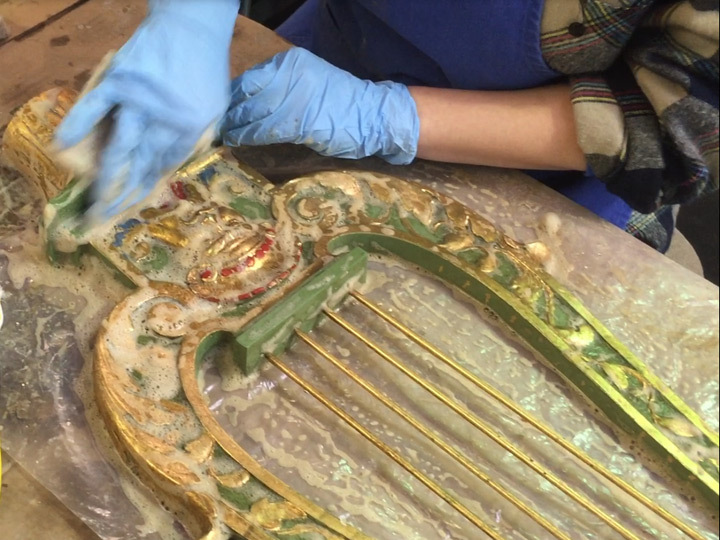 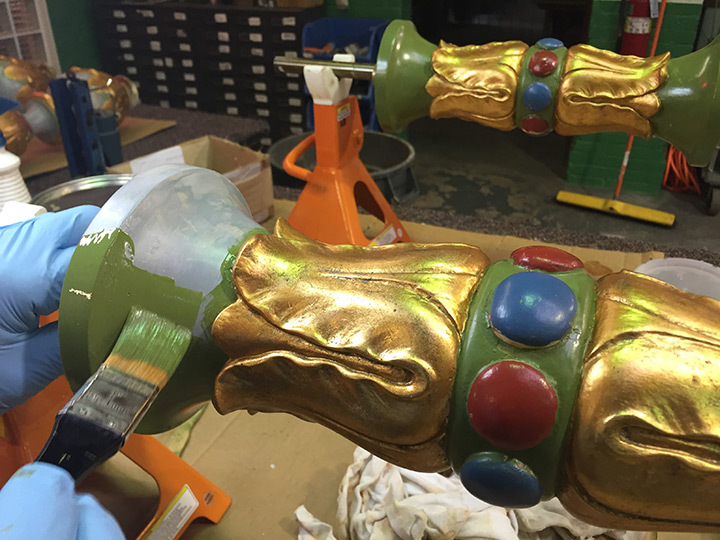 A key element in restoration, as well as with the new fixtures, was to assure that all of the colors that were being applied during this process were historically accurate, and matched what were originally applied, as well as to compliment the colors of the ornate murals in the hotel. 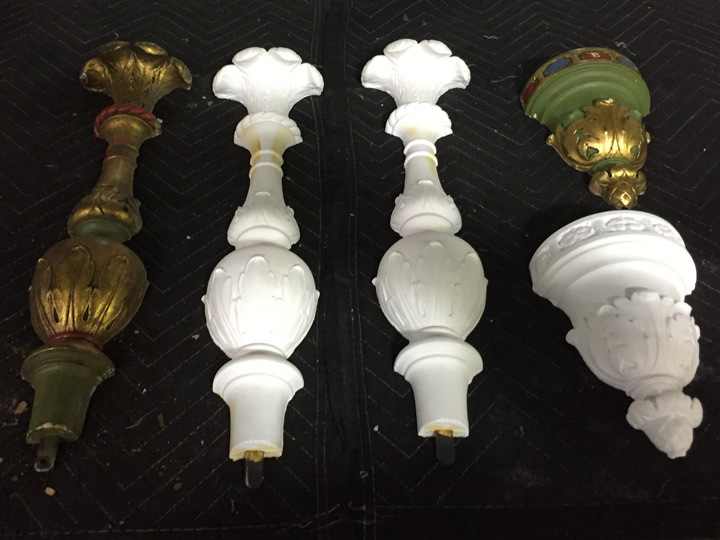 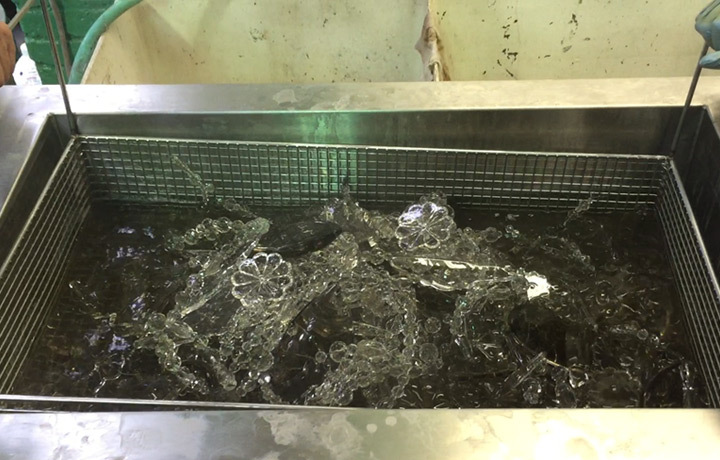 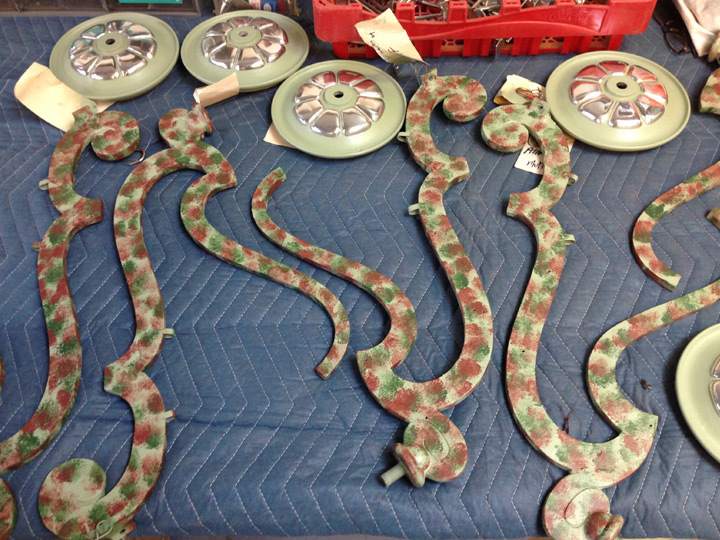 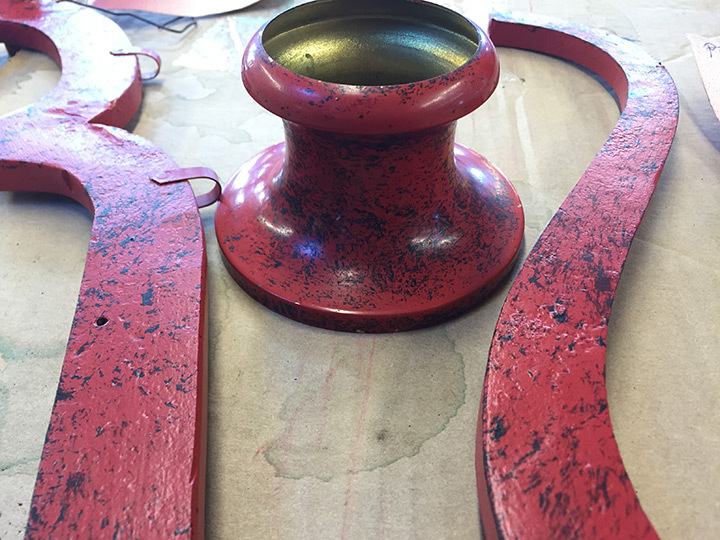 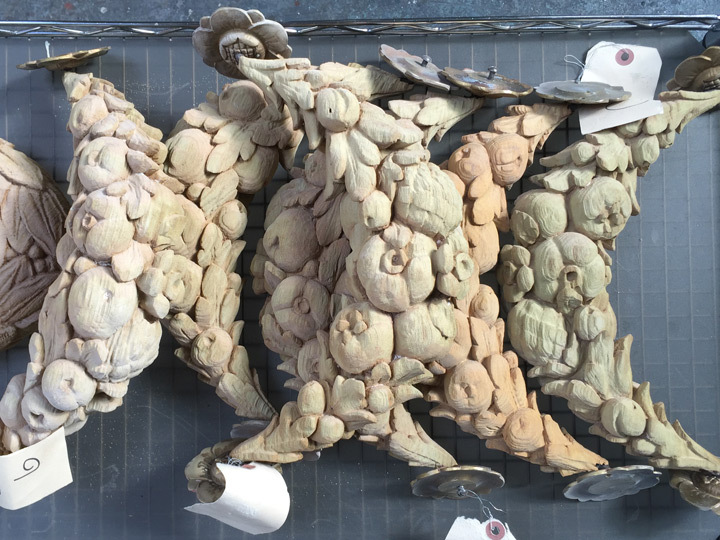 Prior to beginning the process of finish applications to identify what these colors had been, each piece was carefully tested by Grand Light artisans utilizing sophisticated soda blasting equipment that is delicate enough to remove ink from paper without damaging the surface of the paper. 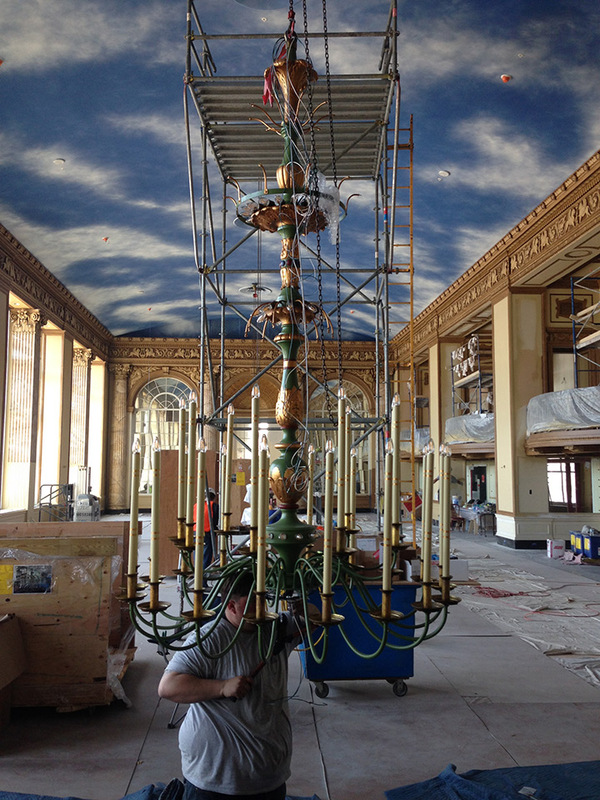 Upon discover of these historic colors, a collaborative effort between the Grand Light artisans, and the artisans whom were restoring the murals established the color palate to be utilized not only on the chandeliers, but throughout the hotel. 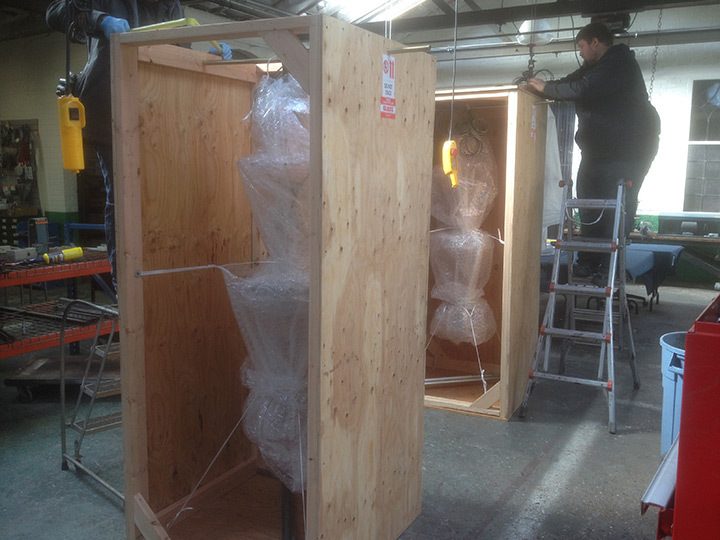 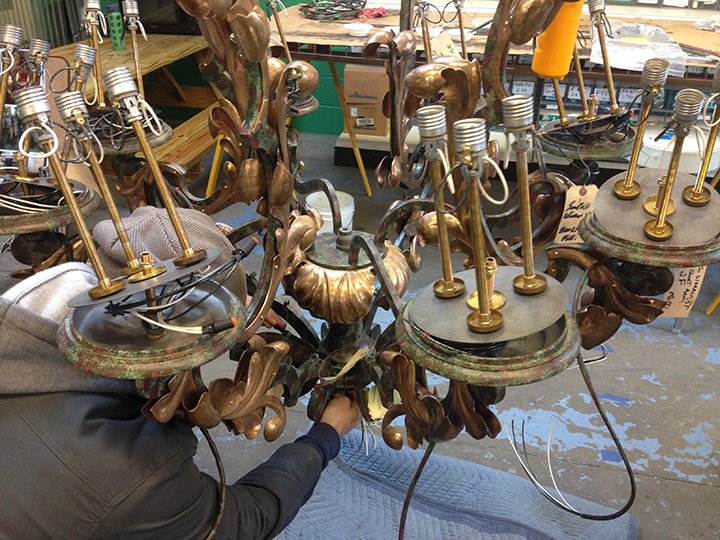 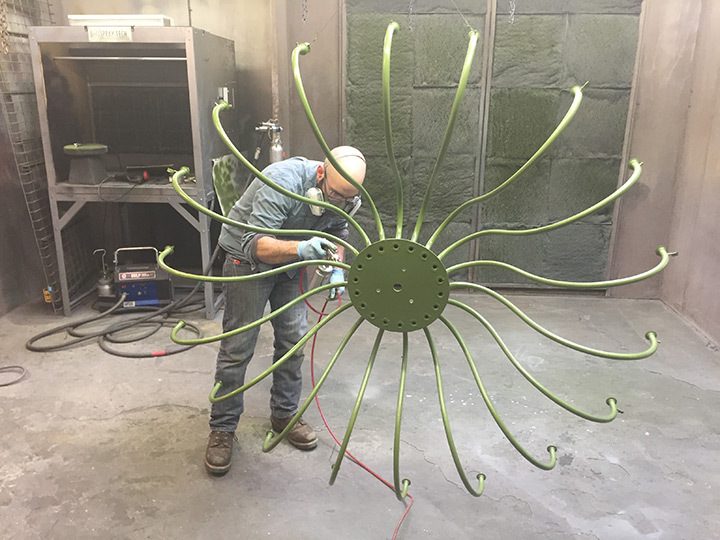 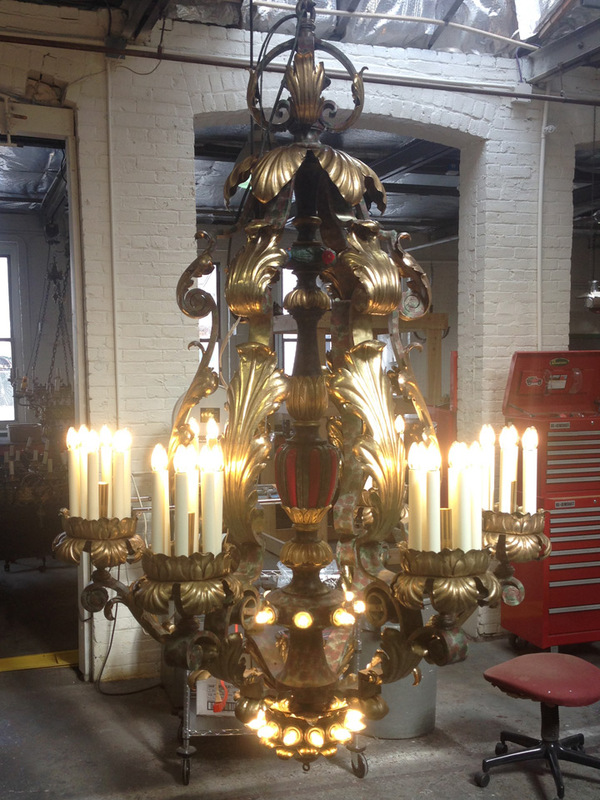 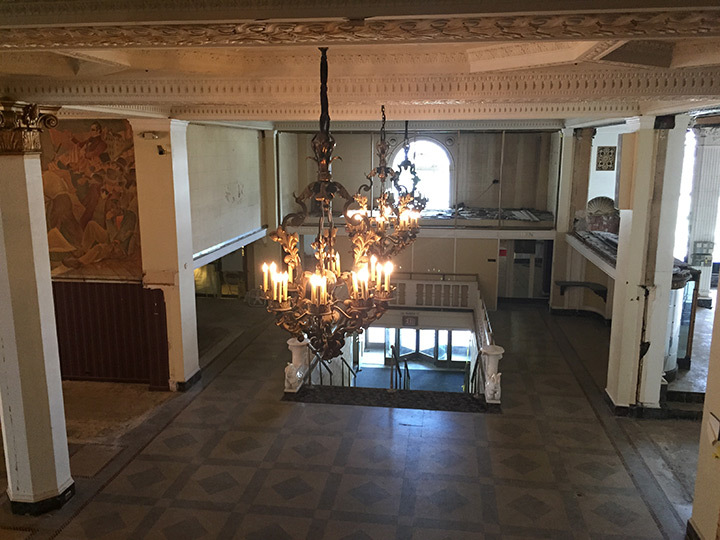 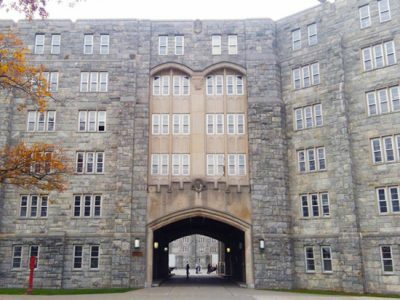 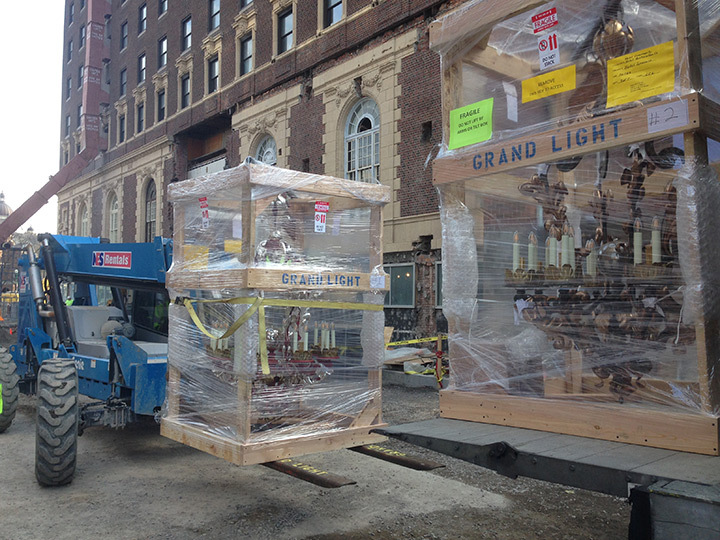 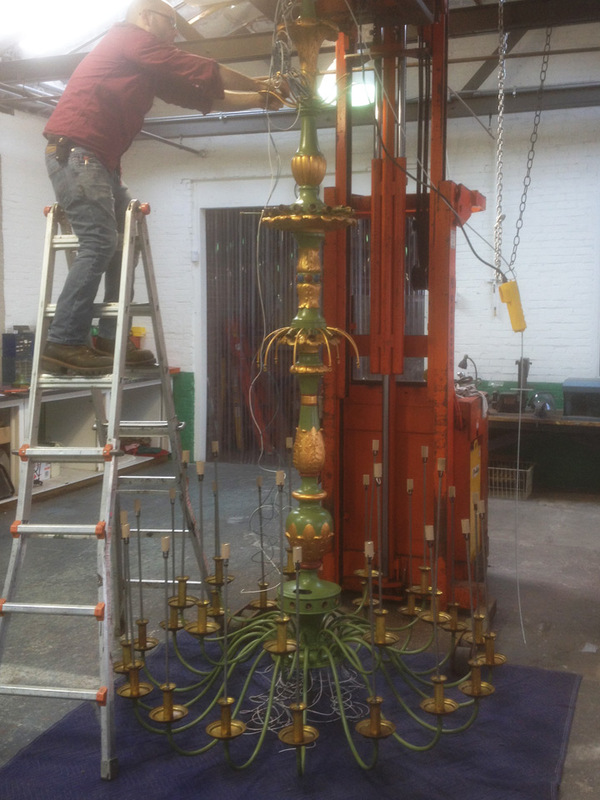 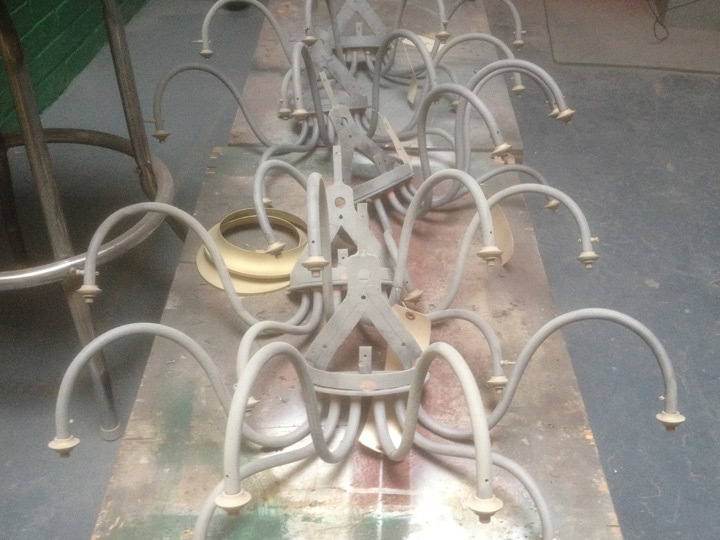 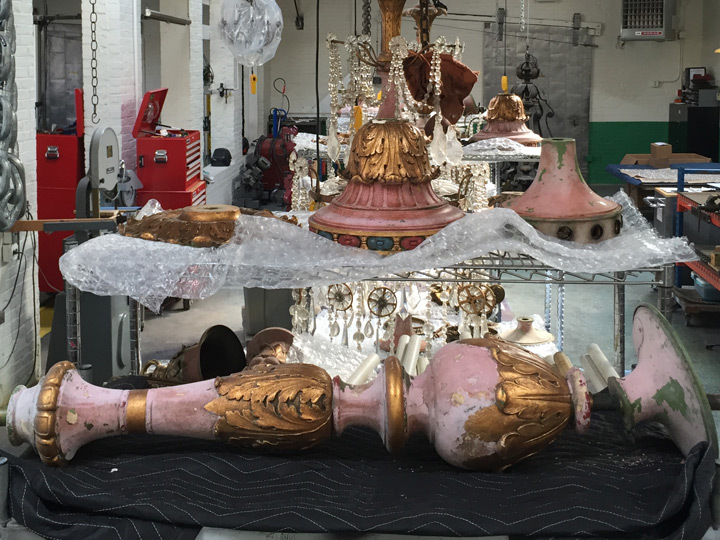 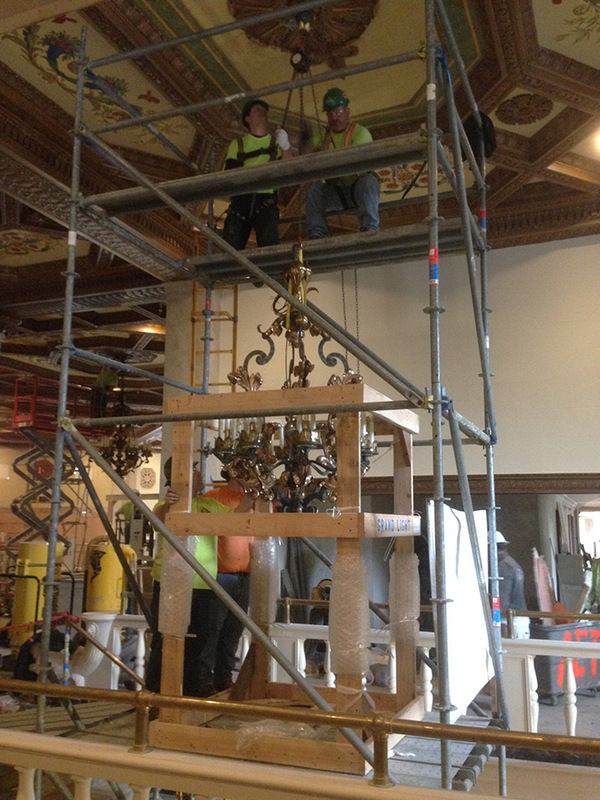 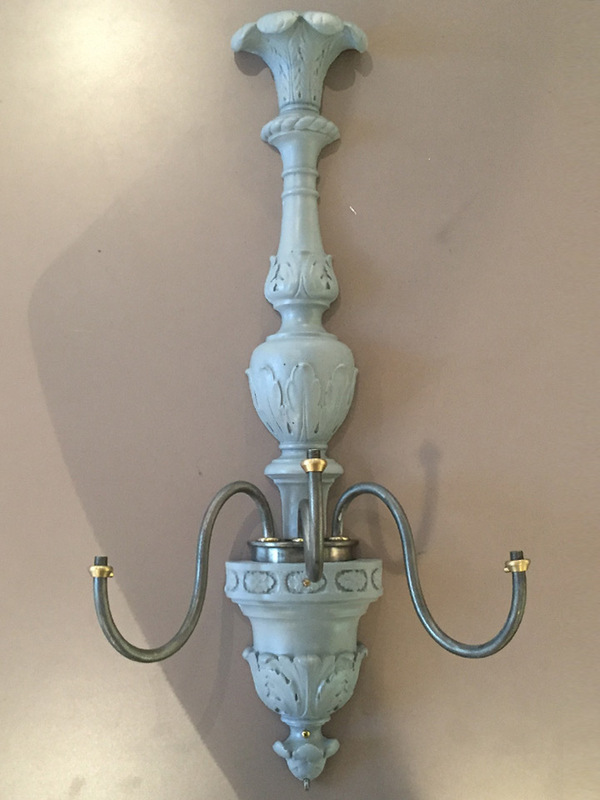 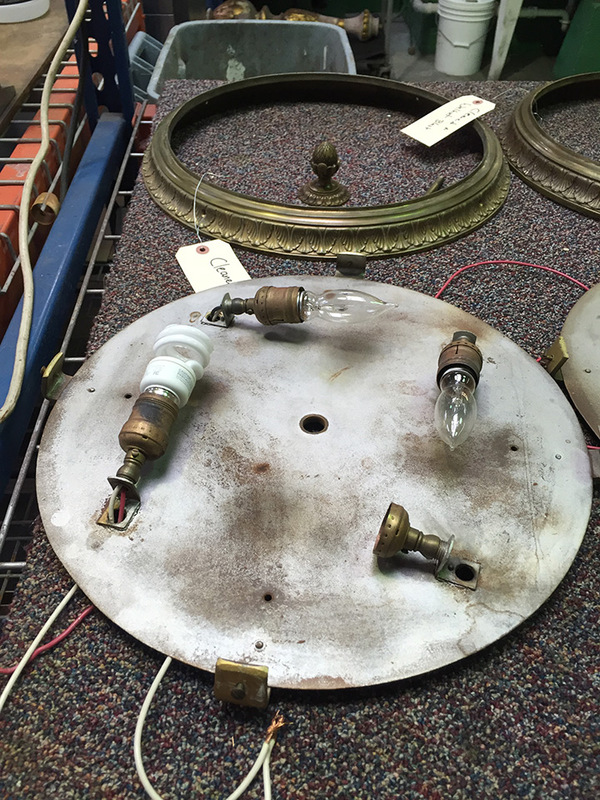 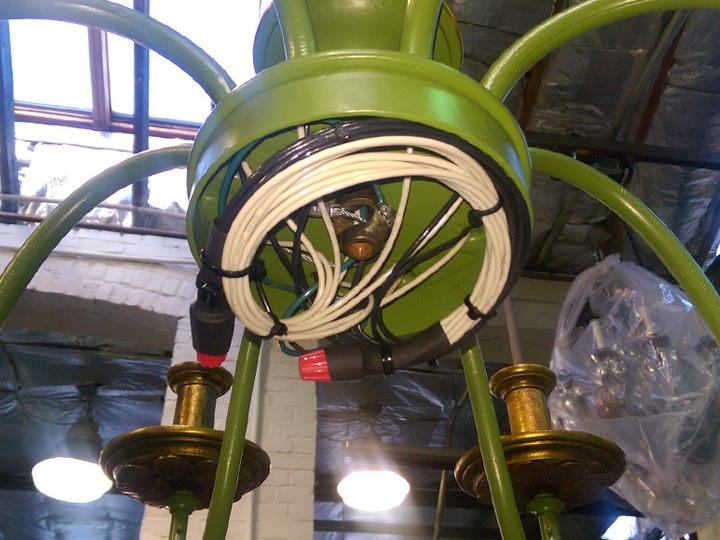 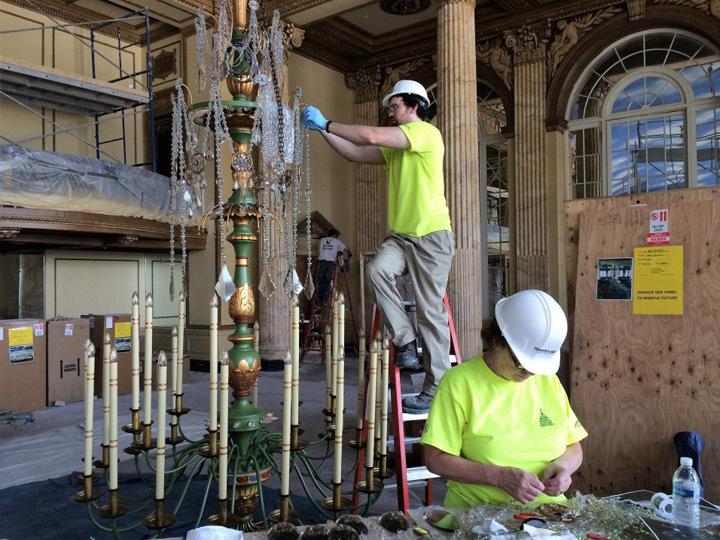 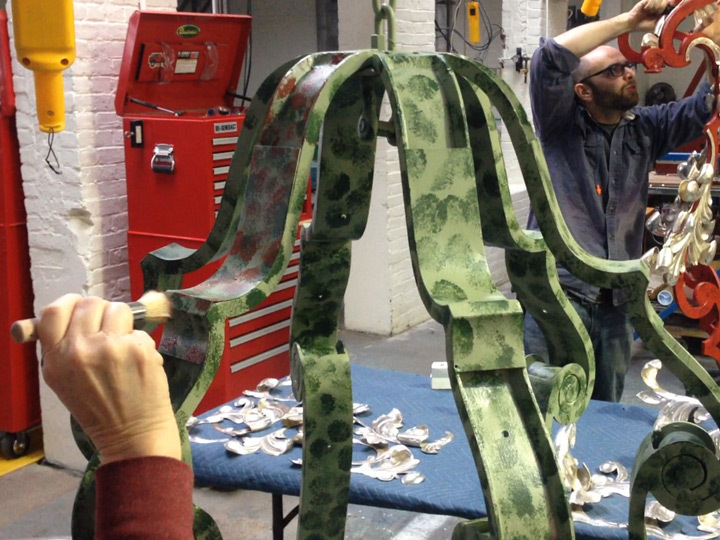 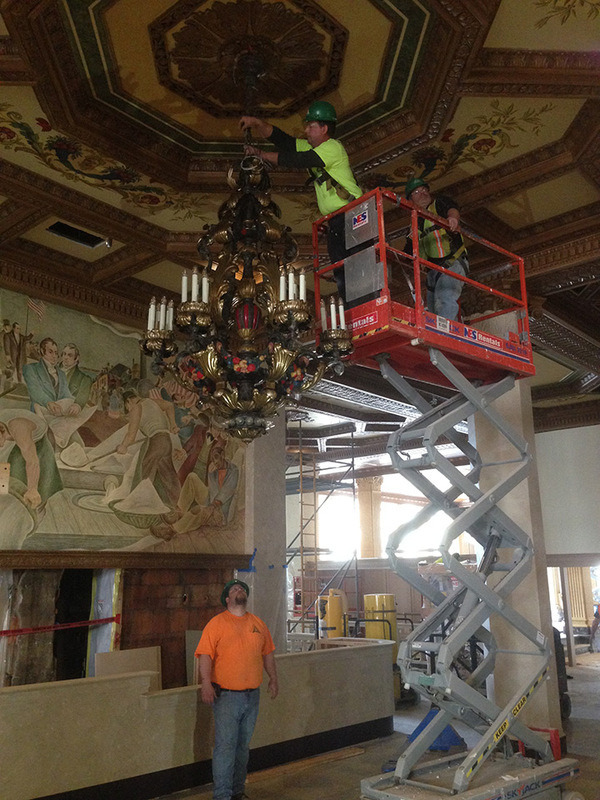 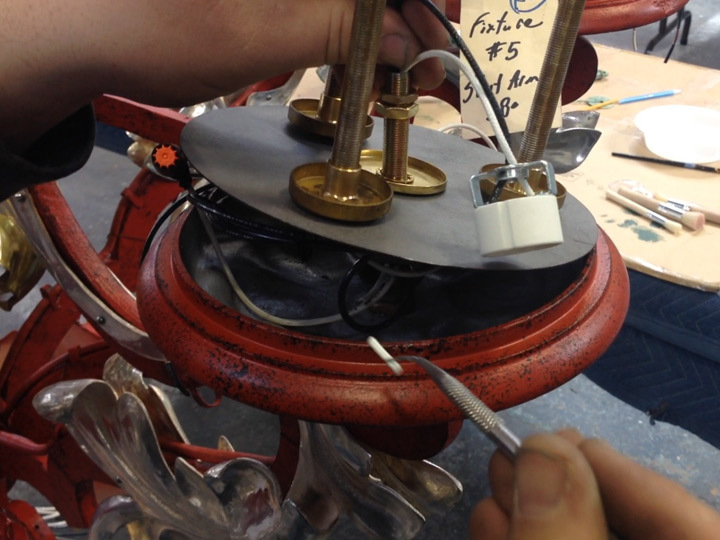 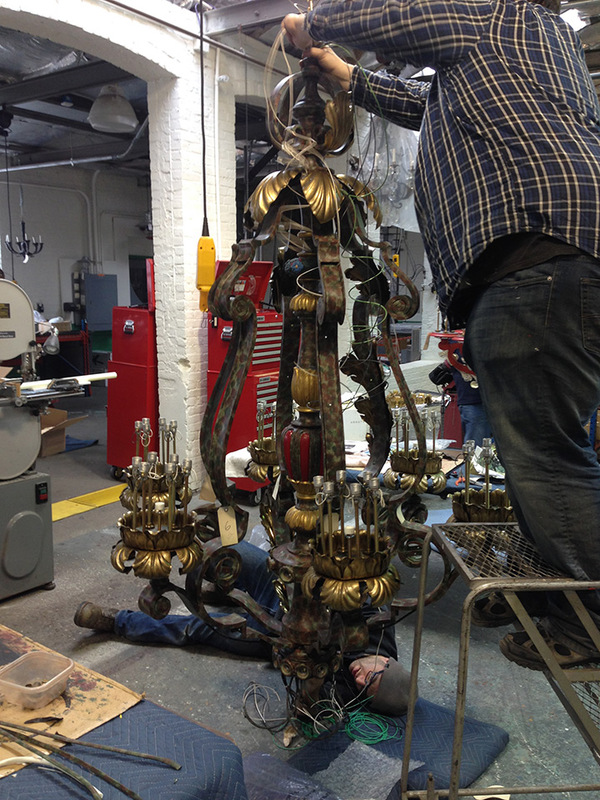 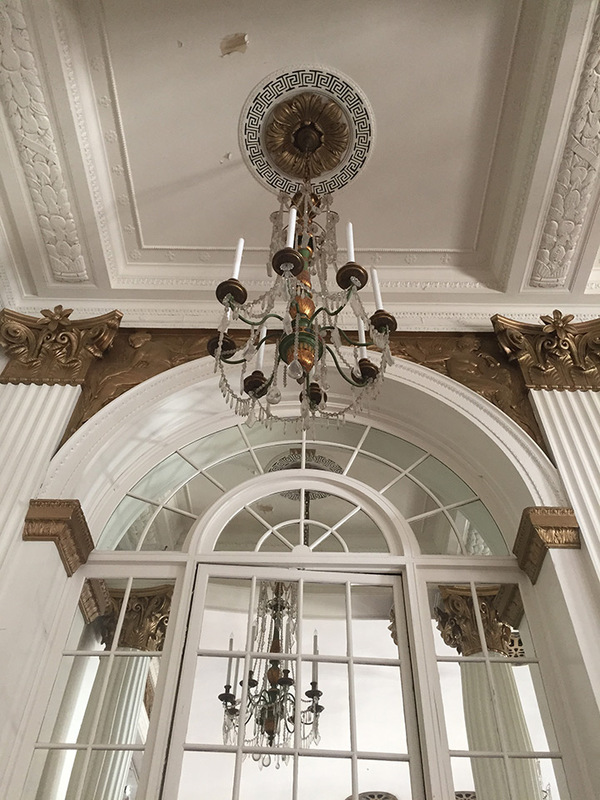 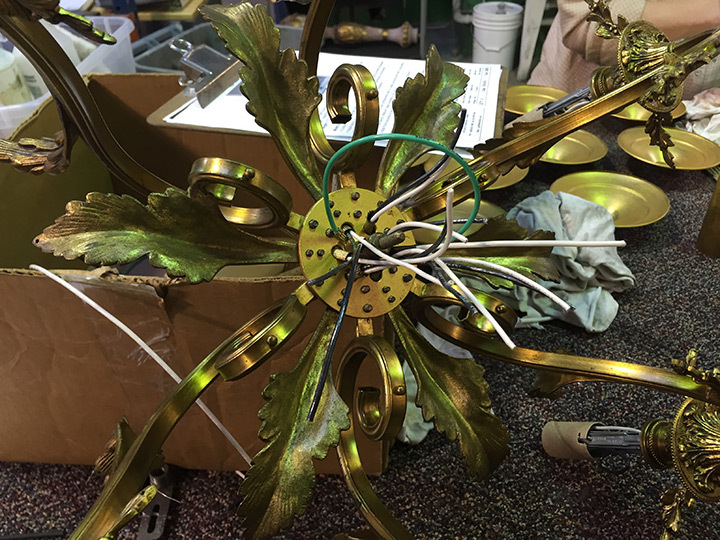 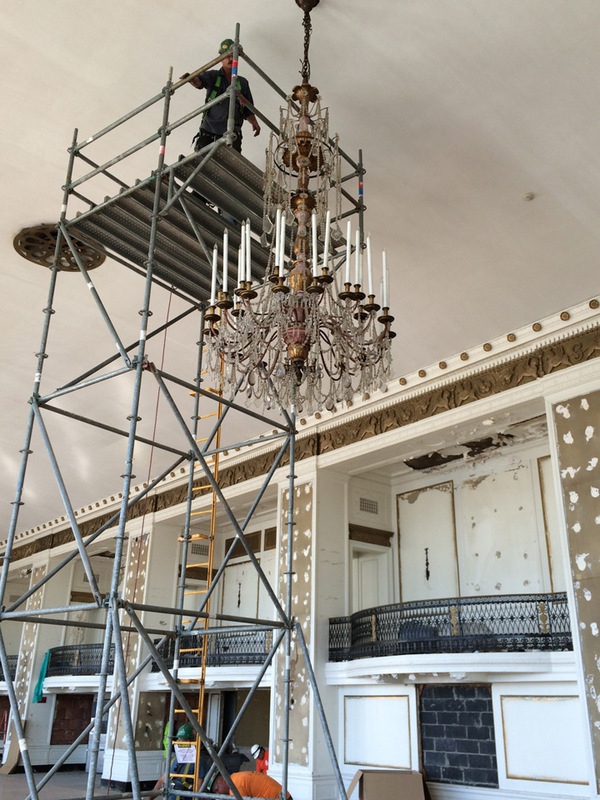 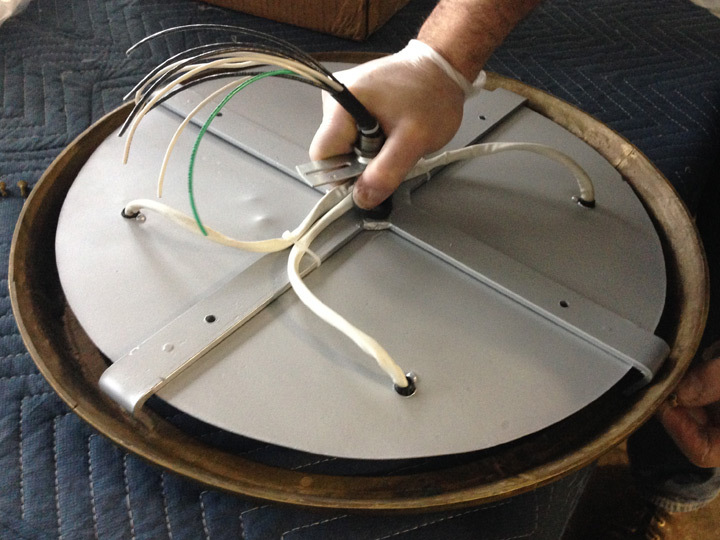 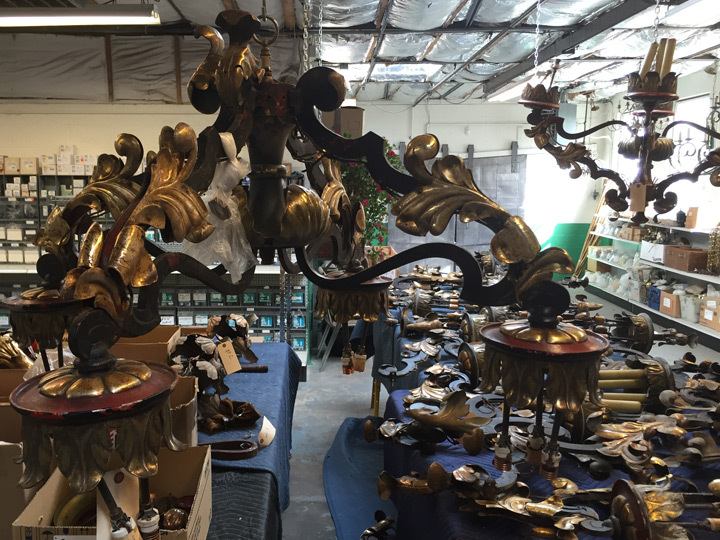 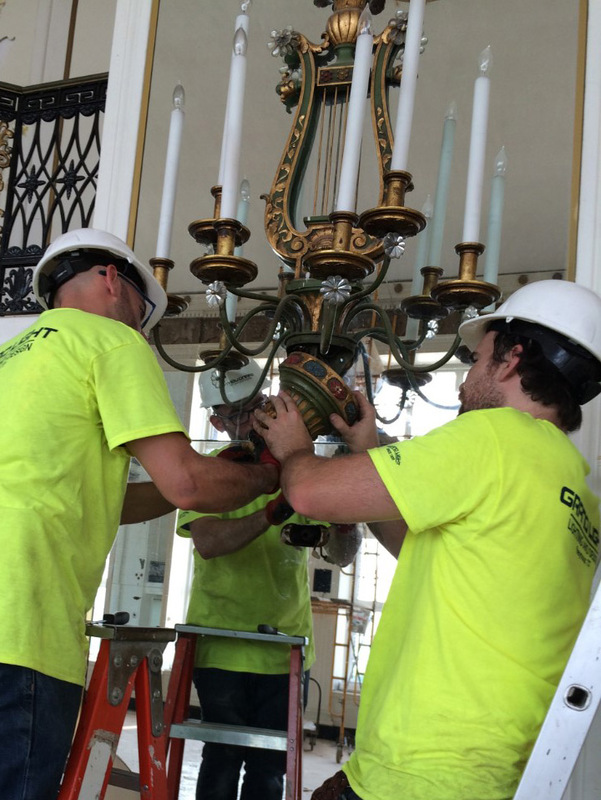 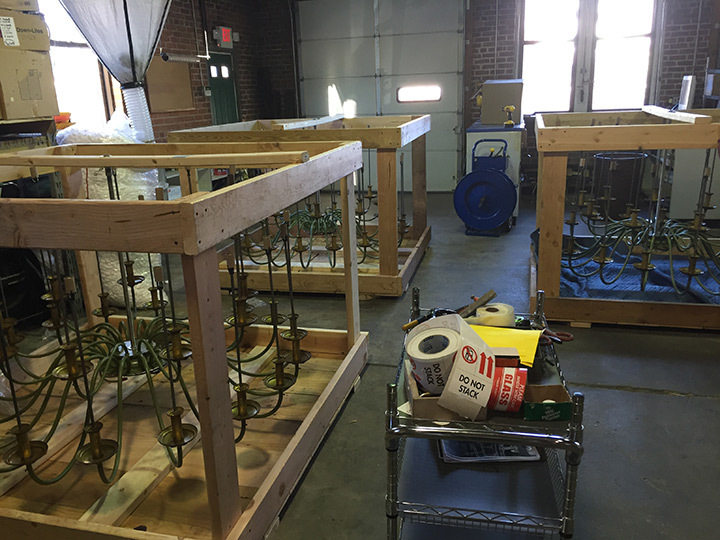 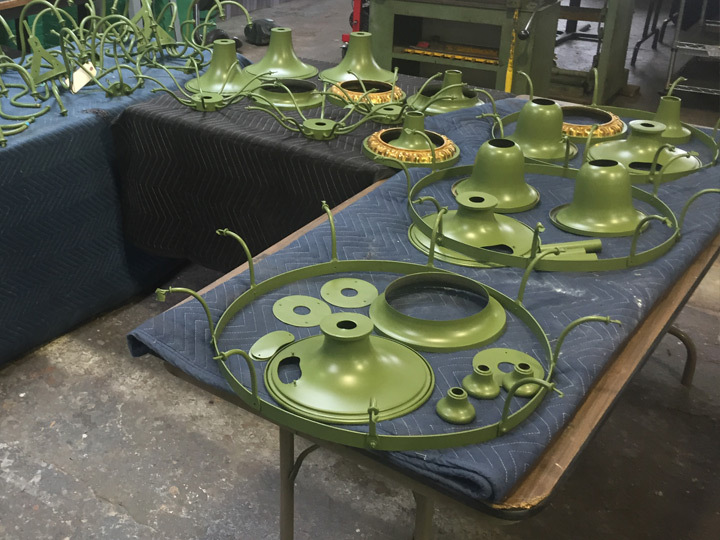 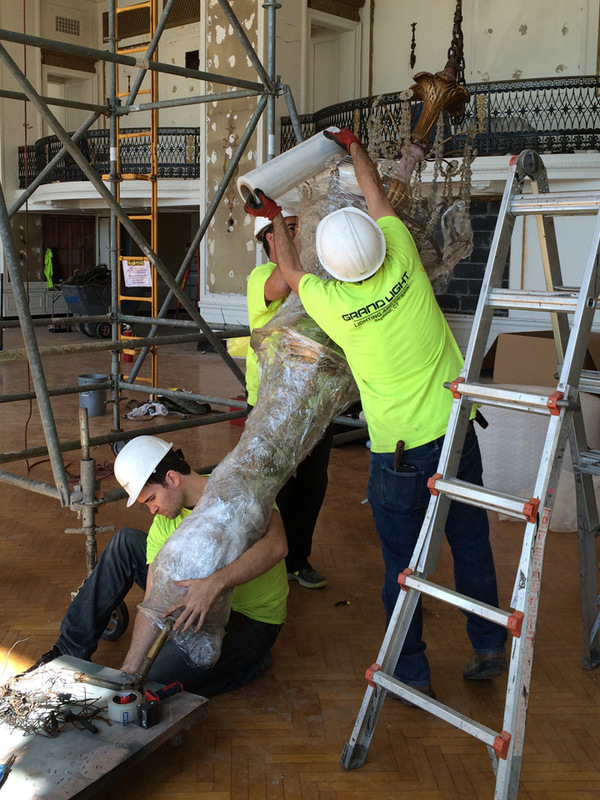 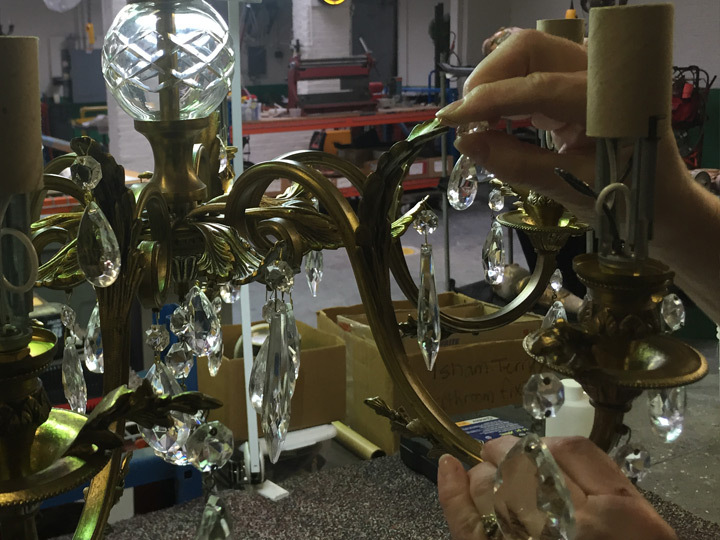 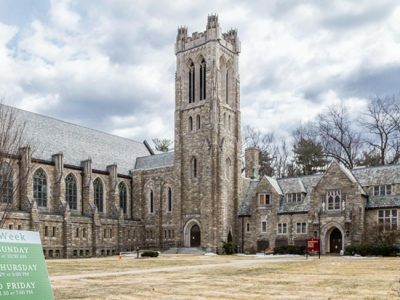 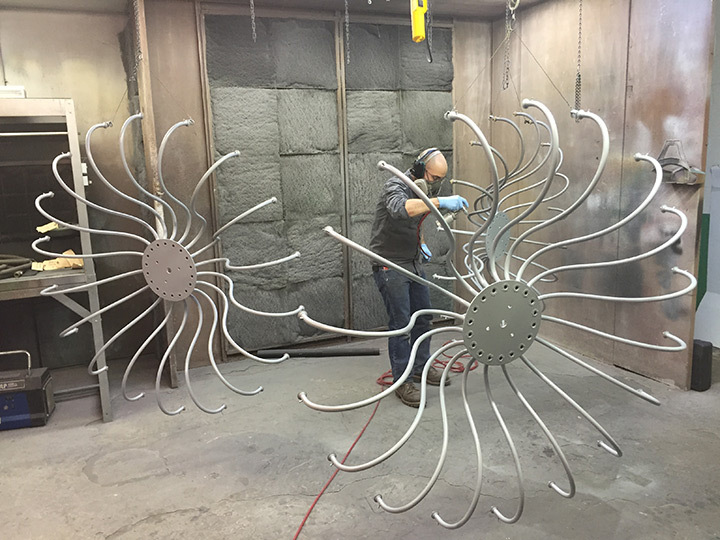 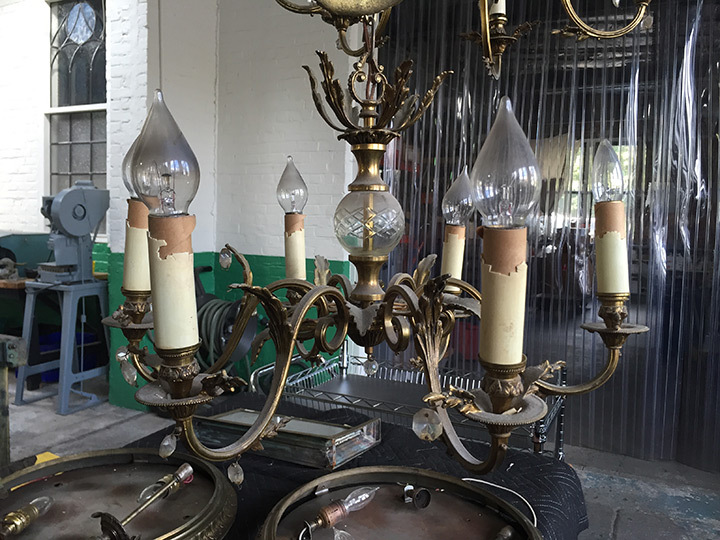 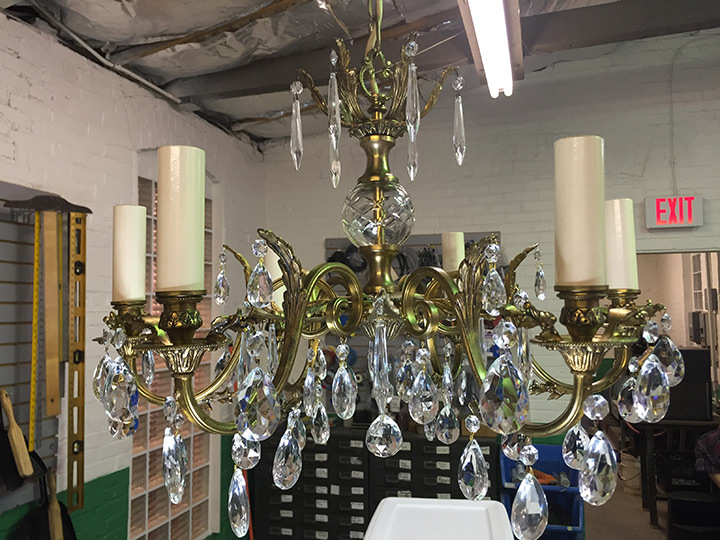 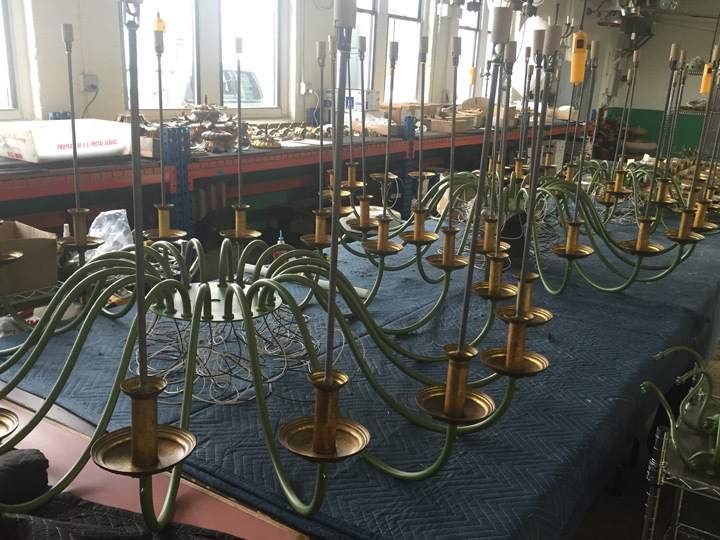 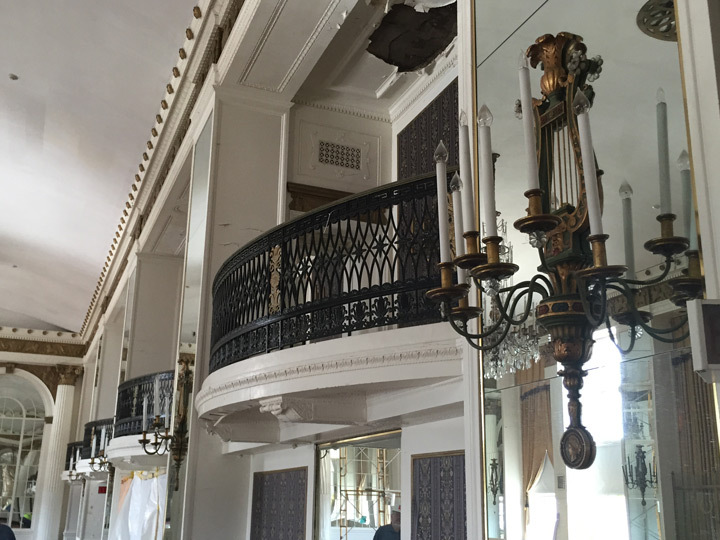 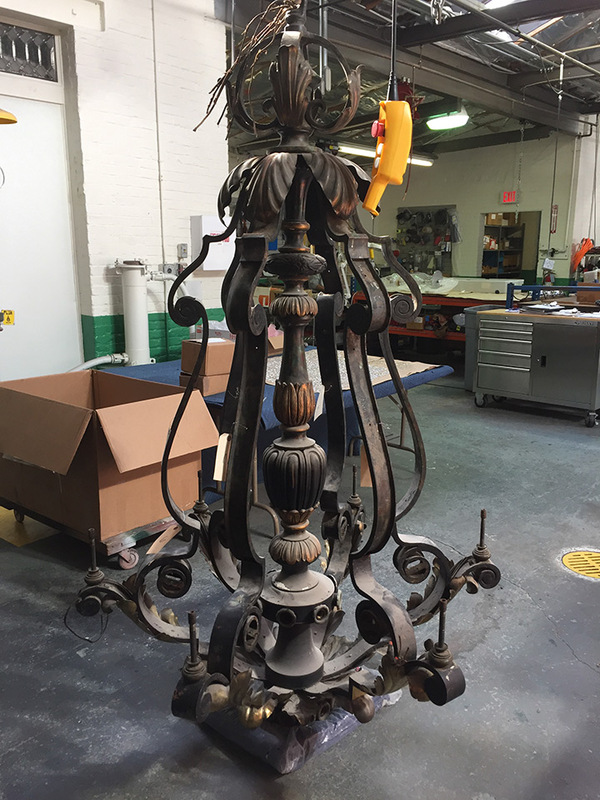 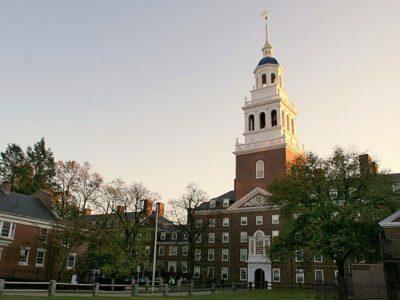 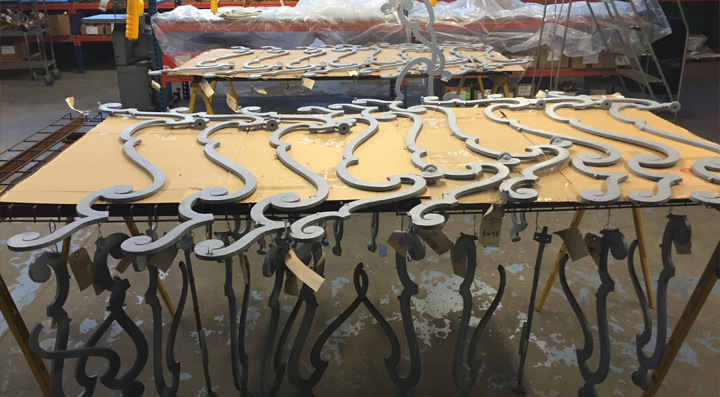 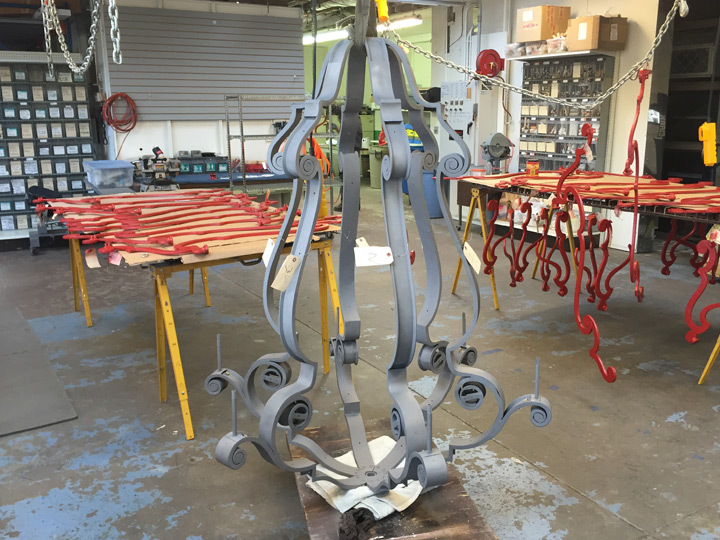 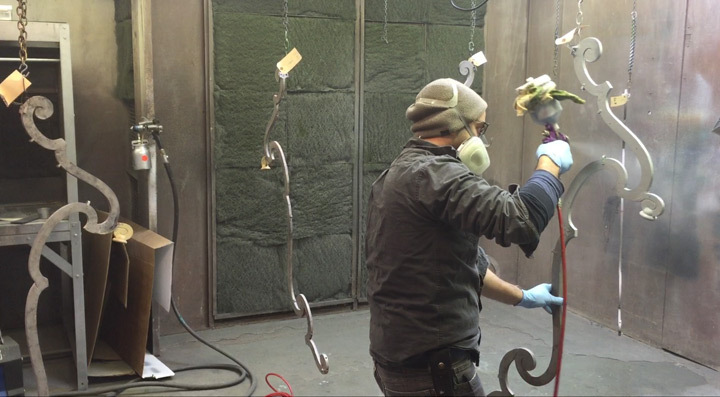 In addition to the historic lighting fixture restoration, the project required the custom design and fabrication of chandeliers and wall sconces based off a historic photograph. 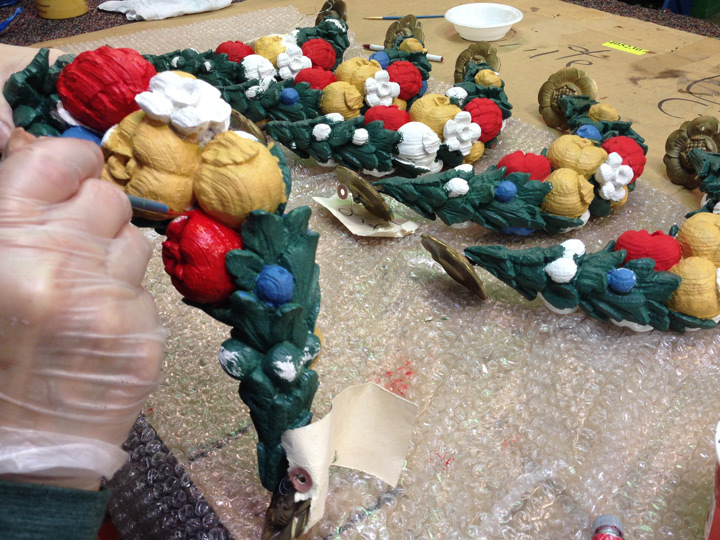 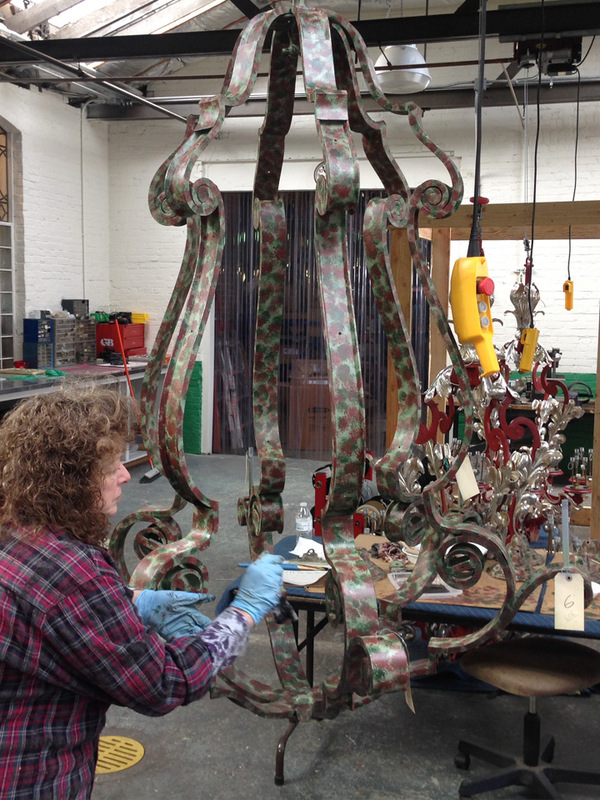 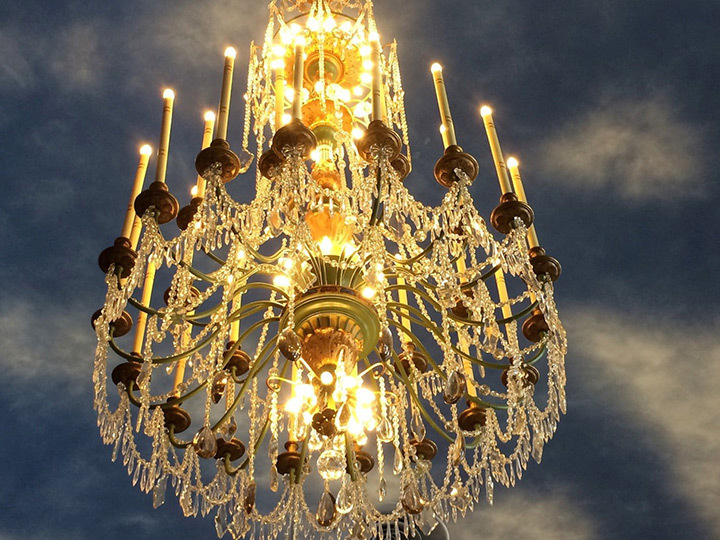 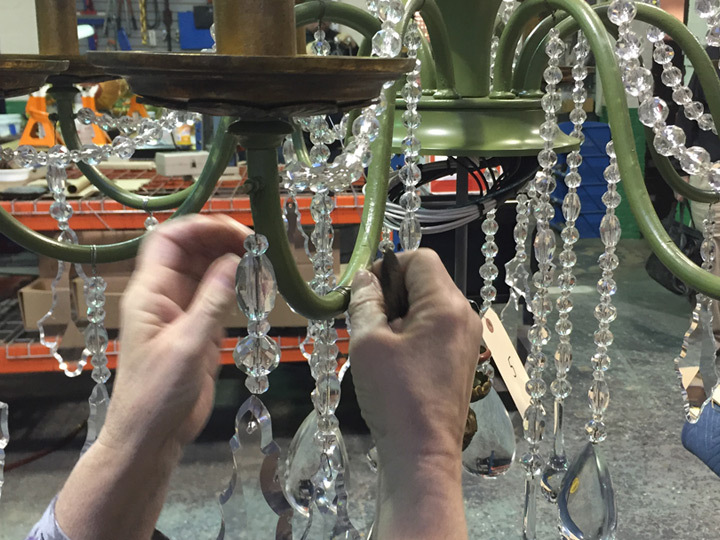 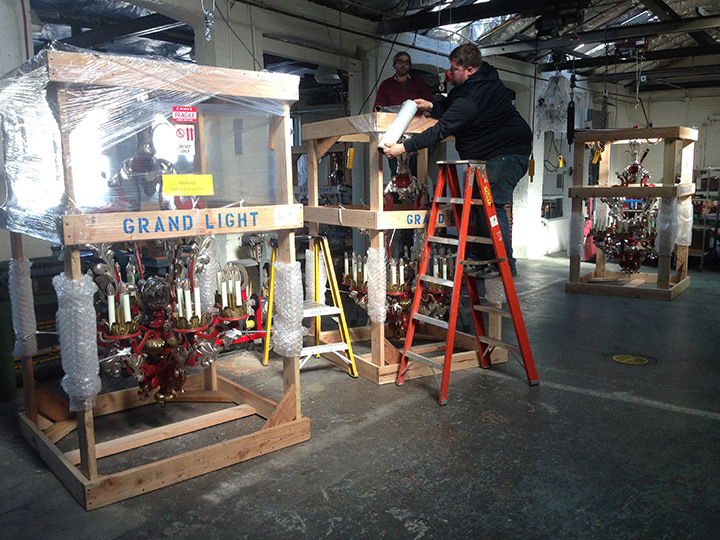 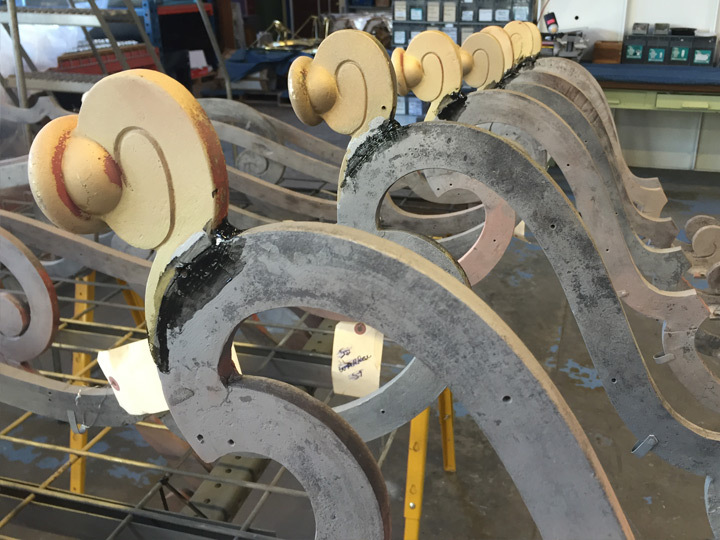 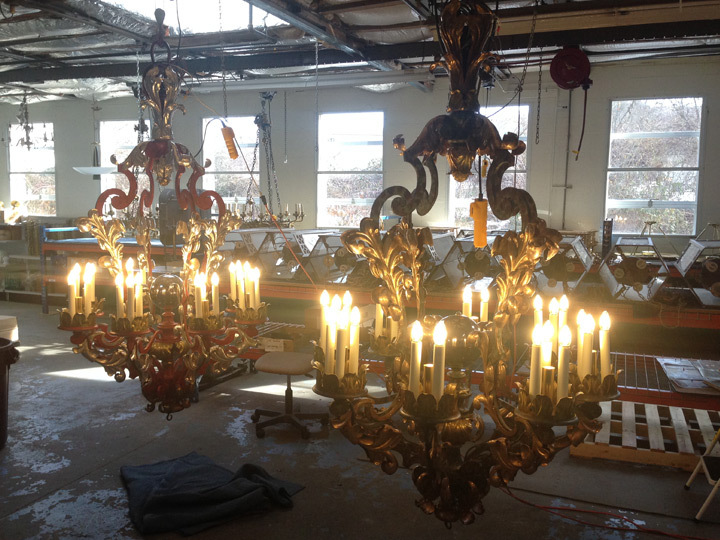 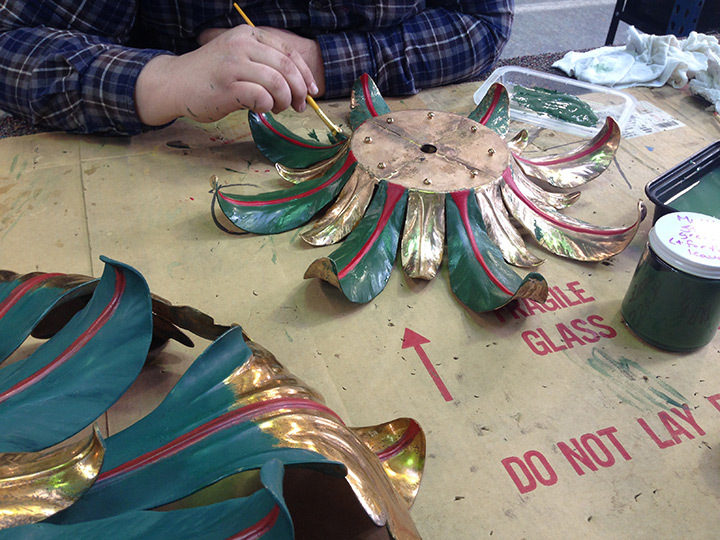 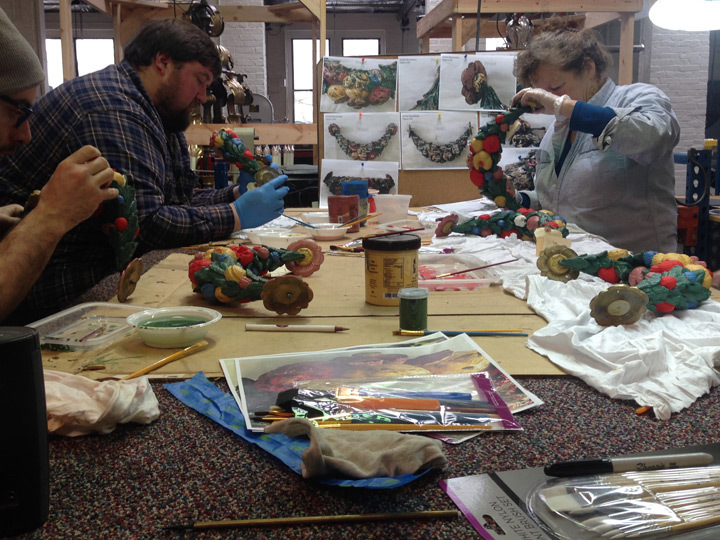 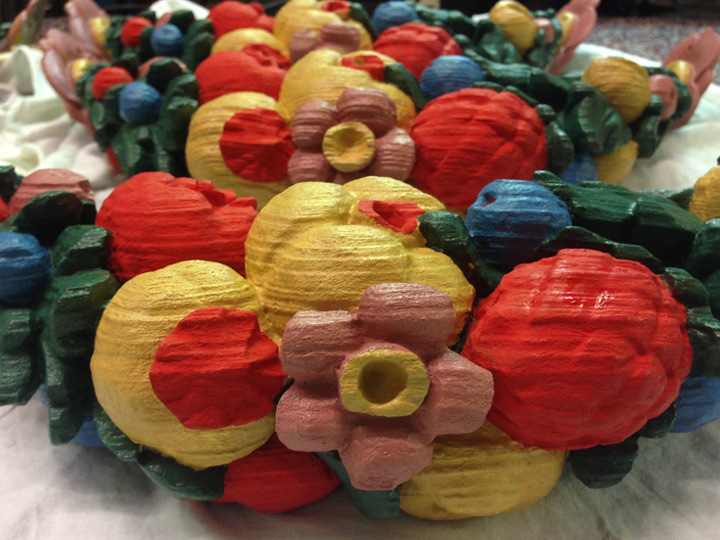 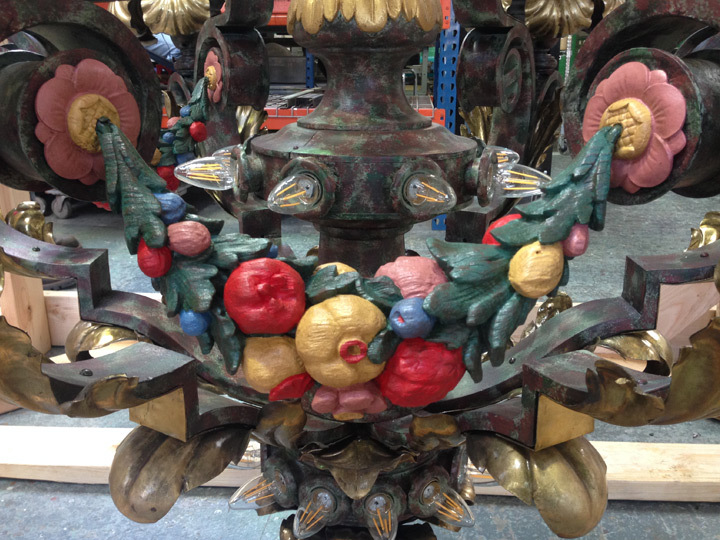 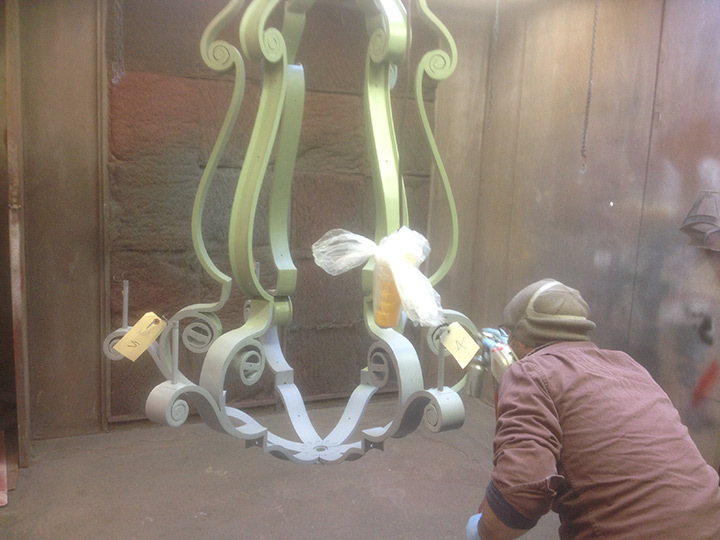 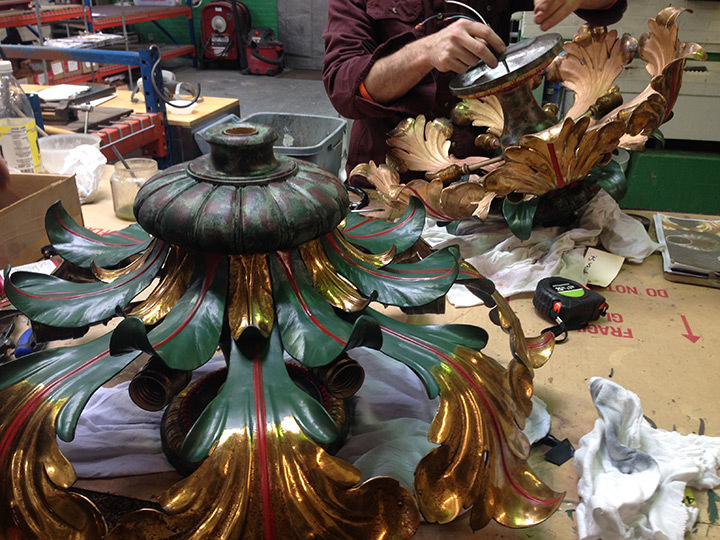 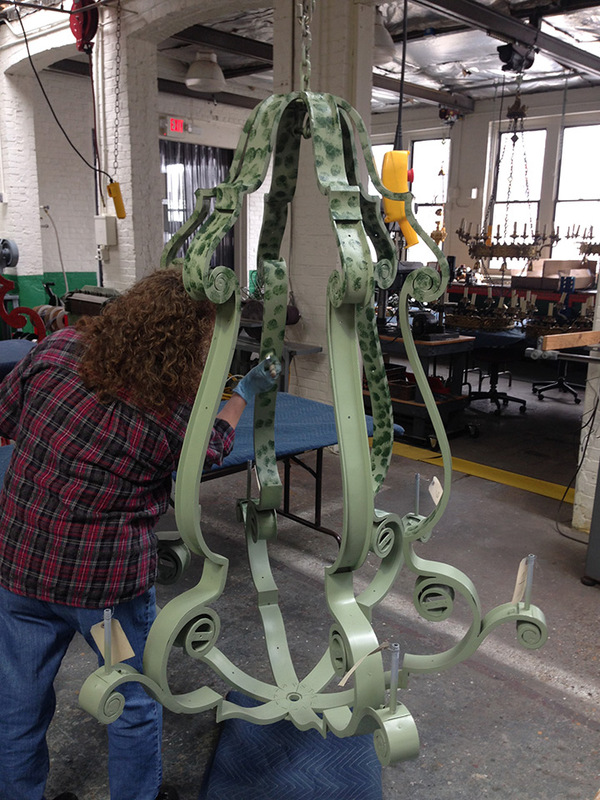 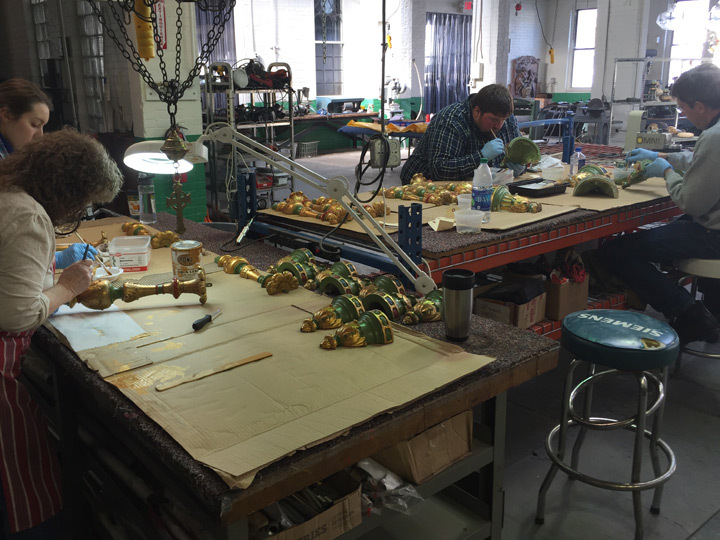 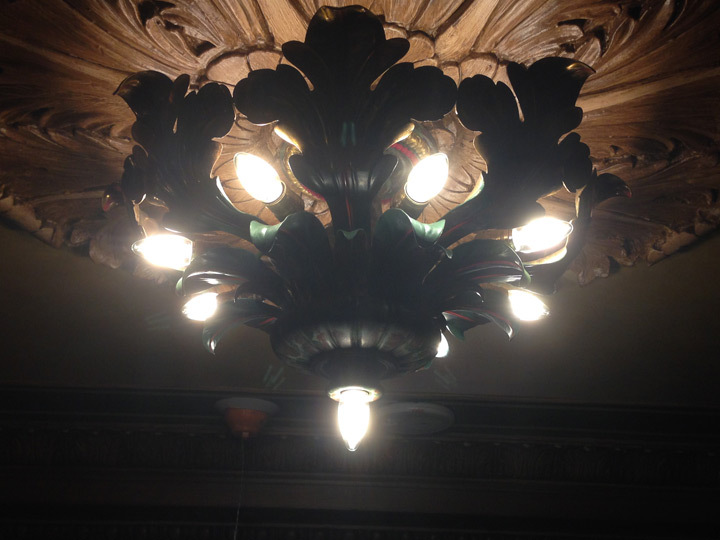 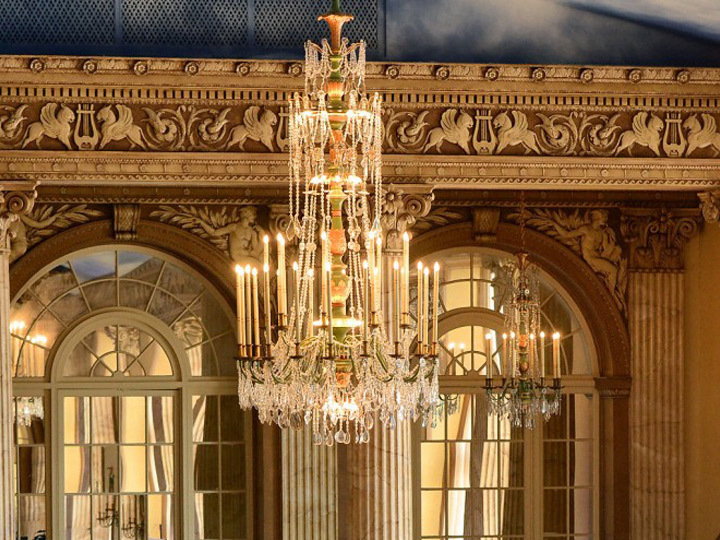 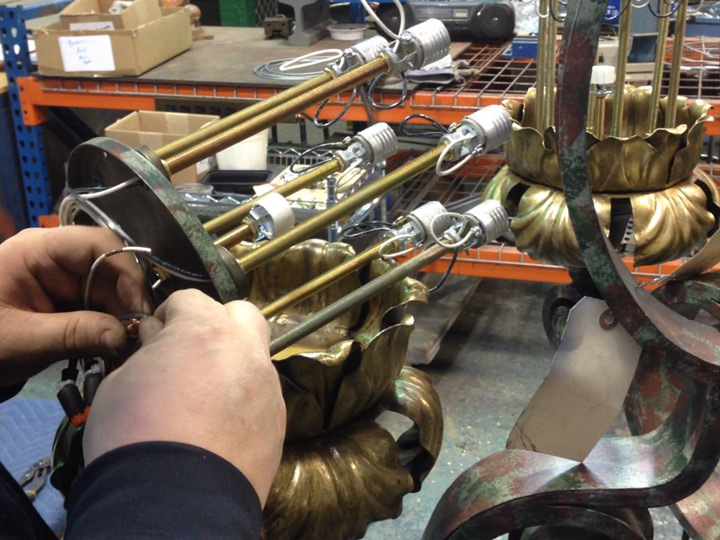 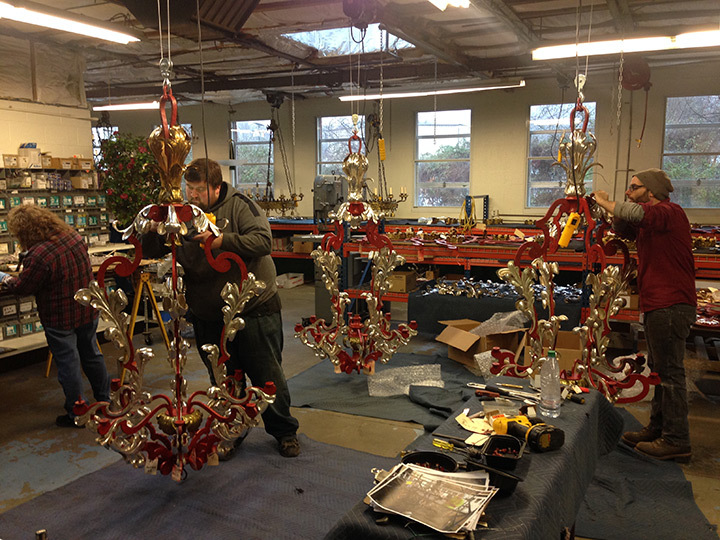 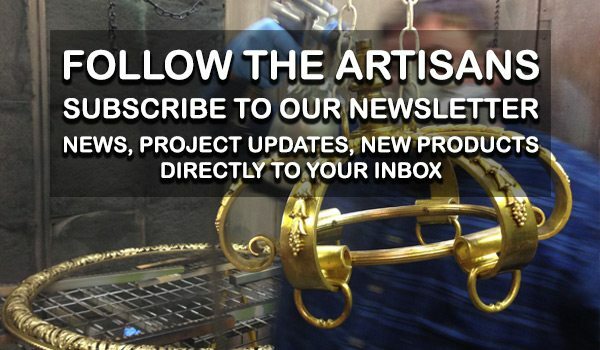 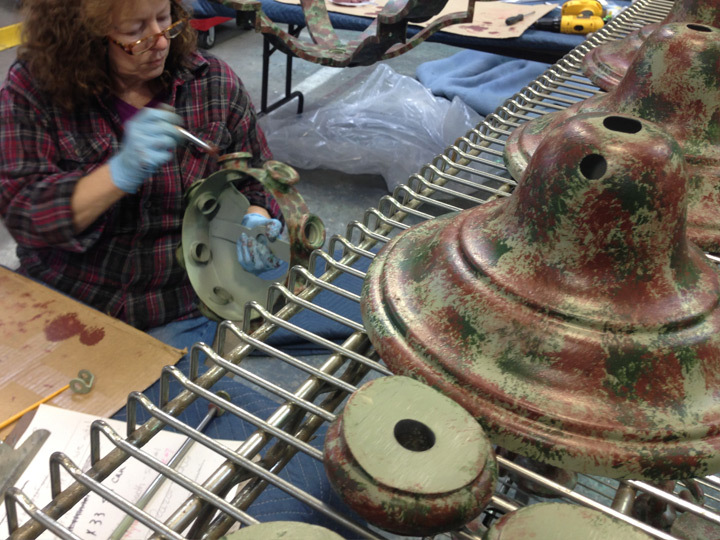 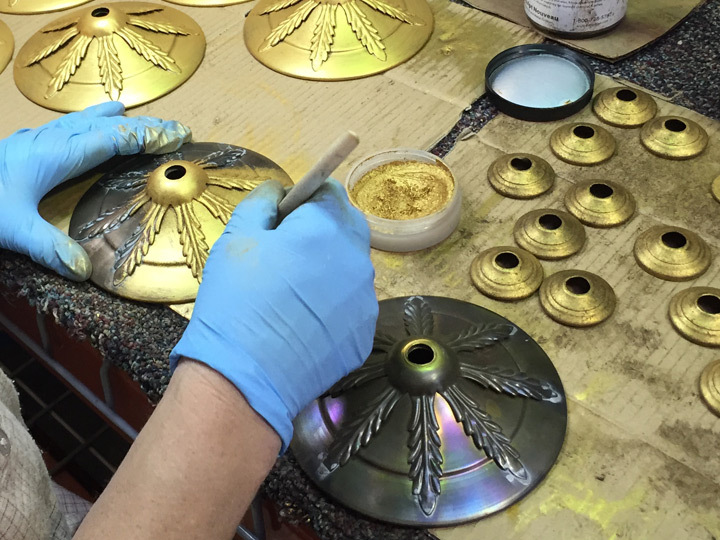 Grand Light artisans hand-paint Lobby chandelier swags with a historically accurate finish.